Emma successfully completes PhD oral examination, is awarded "exceptional thesis"
Expedition 11 home safe from Antarctica! Early this morning Otago Space Physics Group's 11th annual Antarctic expedition returned to Christchurch from Antarctica. They had originally been scheduled to return last Wednesday, but there was a problem with the plane. A new part had to be flown to Christchurch and a repair made - Antarctic travel is never easy. In the end they left Antarctica every early in the morning of Friday 23 November, and landed in Christchurch at about 630am. They only just had time for immigration and biosecurity clearance, handing back the clothing to Antarctica New Zealand, before boarding the 830am flight to Dunedin. Welcome home James and Myles! Another productive and successful trip to the ice is over [22 November 2018]. Myles Thayer (left) and James Brundell on the summit of Observation Hill, Ross Island, Antarctica. Mt Erebus is visible in the distance and the Memorial Cross can be made out too in the reflection of James' sunglasses! 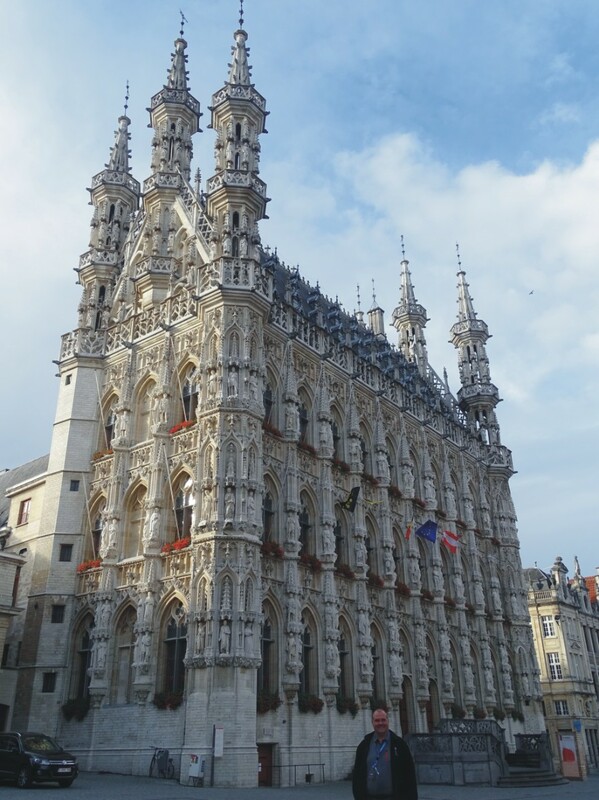 Craig Rodger returned to Dunedin on Monday 12 November, having flown back from Europe where he was attending the European Space Weather Week conference in Leuven. The next morning he hopped on a plane in Dunedin airport to start the travel associated with a series of Public Lectures. 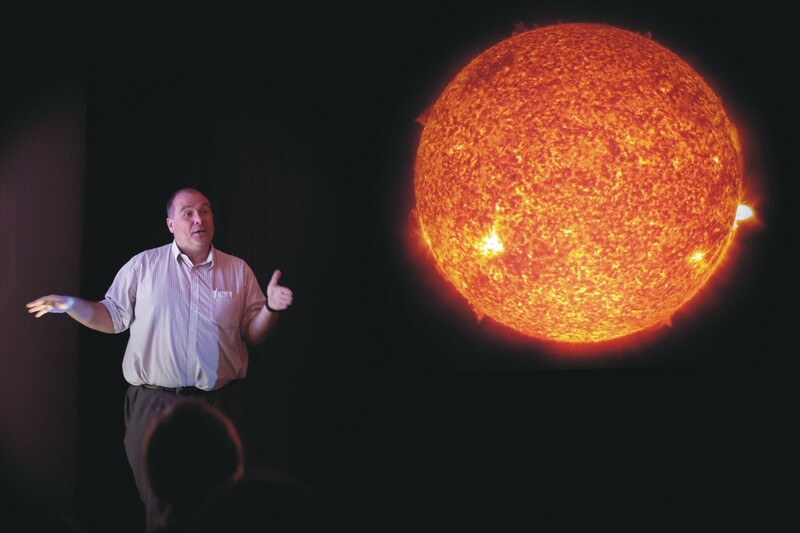 Craig travelled to Auckland, Christchurch and Wellington (yes, in that order) to give open lectures on Space Weather. The talks were given by a team of three - Craig on the basic ideas behind Space Physics and the physical impacts on technology, Malcolm Ingham (Victoria University of Wellington) on possible impacts on pipelines, and Ian Griffin (Otago Museum) on auroral viewing and his obsession with chasing the southern lights. The networking discussions after each talk were great opportunities for the people present to ask questions and chat. The Wellington event clearly included a lot of participants from many different government departments who were keen to learn more. The after match discussions were fascinating! During our travels we also visted the US Consulate in Auckland and one of the Transpower National Grid Operating Centres in Christchurch. The invite for the public talks. That is Craig in front of the Sun. The public talks triggered a small series of media interest. First of all, the Otago Daily Times wrote an article entitled (Focus on 'Space Weather') on 14 Nov 2018. This was followed up by a recorded interview played in the Weekend Variety Wireless show on 17 Nov 2018 - that interview was a bit of a struggle as it was recorded a few hours after Craig had landed in Dunedin coming back from Europe! Then today Craig was interviewed live by Kathryn Ryan for the Nine to Noon show of Radio New Zealand. The web team at Radio New Zealand produced a very fine summary article from the interview. But what a week it has been. [20 November 2018]. This morning the Otago Space Physics Group's 11th annual Antarctic expedition departed Christchurch for Antarctica. As has become a tradition, we received a picture from the team not long before the USAF C-17 transport left Christchurch. Space Physics Expedition Eleven is made up of Dr James Brundell and Myles Thayer. This is Myles's first trip to the ice, and James' tenth. This year there were no mechanical or weather delays, and the plane departed on the day which was planned many months ago! The logistics support, comprising air transport, accommodation, and all other on-ice support is provided through Antarctica New Zealand Event K060. James and Myles will be based at Scott Base, and will work around the base and also up at Arrival Heights. Expedition 11 will gather high resolution data, undertake calibrations, and possibly replace the top-piece of our electric field antenna outside Scott Base. [12 November 2018]. Expedition 11, ready to go South!! At the end of August Craig appeared on TVNZ's Seven Sharp programme, talking about lightning. This seems to have been well received. In fact, it produced a new invite to join TVNZ reporter Michael Holland on a tour of the new Rocket Lab rocket development and production facility in Auckland. The new facility was opened on Friday 12 October 2018, by the Prime Minister and William Shatner. Alas, Craig was not invited to that! However, the day beforehand TVNZ and Craig had a behind the scenes tour of the facility by Rocket Lab Chief Executive Peter Beck. They spent an hour looking around the factory with Peter, and amost two hours extra without him. While Rocket Lab had only been in the new building for ~3 weeks, they already had 6 rockets being built on the factory floor, and an operational Mission Control Centre in the attached building. The Rutherford engines are built to Peter's design in the Rocket Lab factory in the USA, but the new Auckland factory produces the rest of the rocket - at least the ones which will be launched at Rocket Lab's LC1 on the Mahia Peninsula. During the visit Peter Beck told Craig how Rocket Lab's launch vehicle is designed to limit the produce of new space junk; while most of the space junk in orbit is actually rocket parts and not dead satellites, Rocket Lab is not going to add to this problem. Like many launch vehicles the first stage of the Electron Rocket is discarded into the atmosphere. But Rocket Lab ensures the second stage and kick stage do not go into stable orbits, and will quickly burn up into the atmosphere. Rocket Lab is in a huge growth period right now, hiring 5 to 10 people a week both in New Zealand the USA - this is necessary as they work towards the planned "once a week" launch plan by 2020. This visit was a wonderful chance for the head of Otago's Space Physics group to meet Peter, an internationally successful rocket engineer and respected entrepreneur. As Peter Beck is originally from the South Island, and started work in Dunedin, Craig hopes he will come down and visit our Otago students soon. The Seven Sharp episode was broadcast on Friday 12 October 2018, shortly after the formal opening. 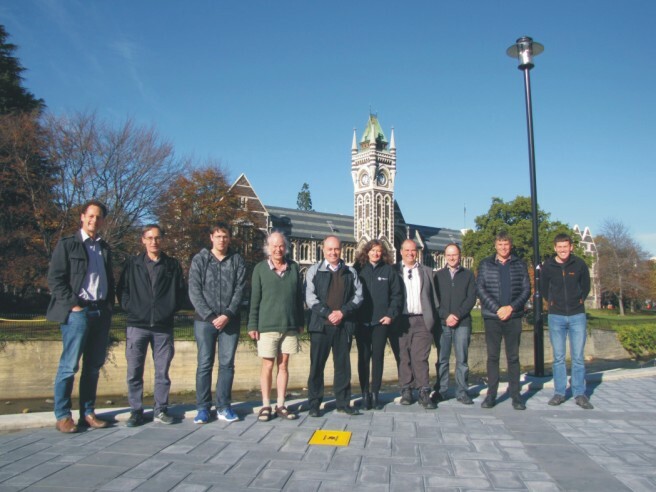 In early October 2018 the Otago Space Physics group hosted the international CHAMOS workshop in Dunedin. CHAMOS stands for Chemical Aeronomy in the Mesosphere and Ozone in the Stratosphere, and is a group of researchers who have gathered for many years to talk about the impact of space on the upper atmosphere. Previous CHAMOS workshops have occurred in Finland, but this year CHAMOS members travelled to the southern hemisphere for the first time.Particpiants came from 4 countries (New Zealand, Finaland, the UK, and Korea) and 5 institutions (University of Otago, Sodankylä Geophysical Observatory, Helsinki University, British Antarctic Survey, and Korea Polar Research Institute). The workshop ran from 8 to 12 October 2018. Present from left to right: Ji-Hee Lee (Korea Polar Research Institute), Jia Jia (Sodankylä Geophysical Observatory), Maxime Grandin (Univ. Helsinki), Annika Seppälä (Univ. Otago), Emily Gordon (Univ. Otago), Harriet George (Univ. Otago), Craig Rodger (Univ. 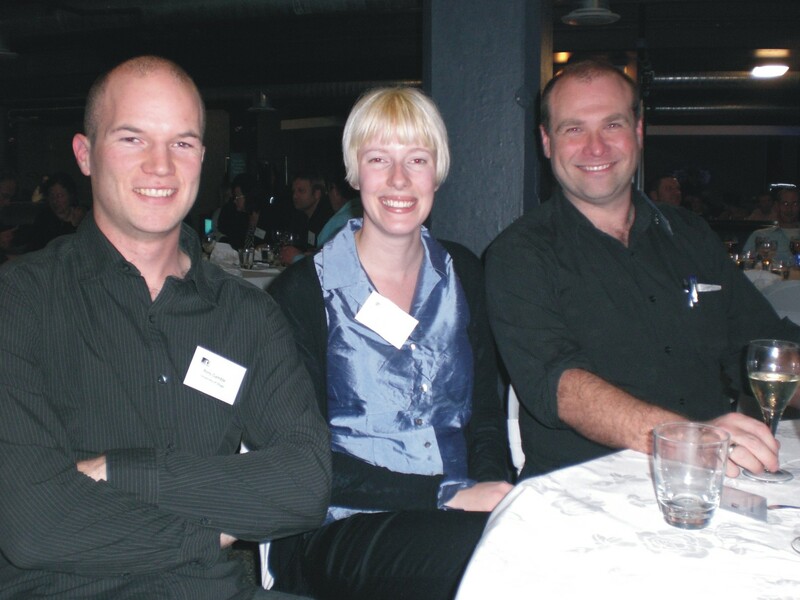 Otago), Mark Clilverd (British Antarctic Survey), Emma Douma (Univ. Otago), Antti Kero (Sodankylä Geophysical Observatory), and Esa Turunen (Sodankylä Geophysical Observatory). How 3 years have sped by. At the end of September 2018 our 3-year MBIE funded Space Weather research project came to an end. 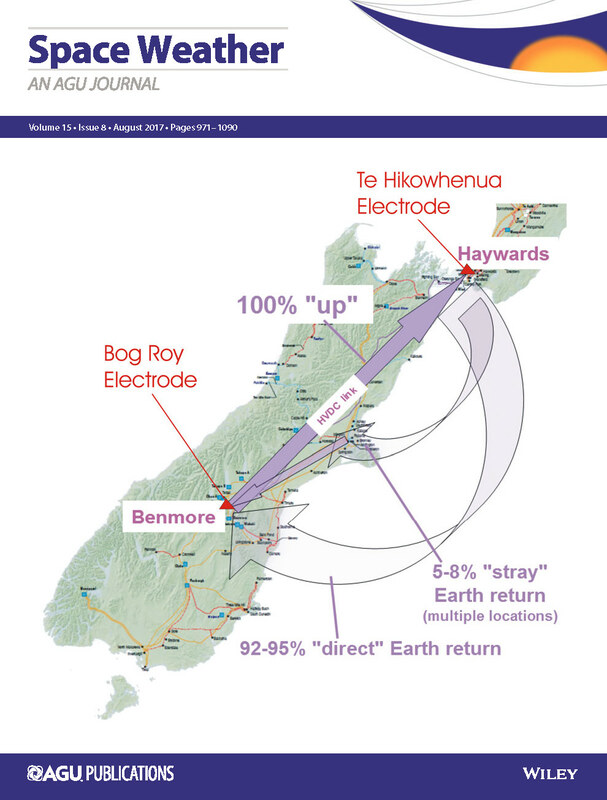 The project was entitled Solar Tsunamis: Mitigating Emerging Risks to New Zealand's Electrical Network. In the last 2 days of September 2018 we hosted a workshop to report on the results of our research. Highlights were 7 research papers, two editors highlights, a cover image and 5 presentations to Transpower staff about the research. We also launched an aurora alerting service for the lower South Island. Participants in the workshop included people from Transpower, Otago University, Victoria University of Wellington, British Geological Survey, British Antarctic Survey, and GNS Science [27-28 September 2018]. The close down workshop also brought back 3 of our UK collaborators to Dunedin! Wednesday 29 August was a big day for news coverage of the Space Physics research group. Early in the day the US Embassy & Consulate in New Zealand posted two articles about Craig Rodger's research. These appeared online as Space Weather and Kiwis at NASA: More exciting areas of U.S.-NZ scientific cooperation and Lightning Storms! Volcanoes! Even more exciting areas of U.S.-NZ scientific cooperation. Completely independently journalists from TVNZ's Seven Sharp programme were in touch with Craig about lightning, and ended up flying a TV crew down from Auckland to shoot footage in the Physics Department. The film crew arrived at 315pm, left at 410pm, and a piece appeared in that nights show. TVNZ has made the clip available online in a piece entitled "There are thousands of lightning strikes in NZ each years – so who’s keeping count?" [30 August 2018]. 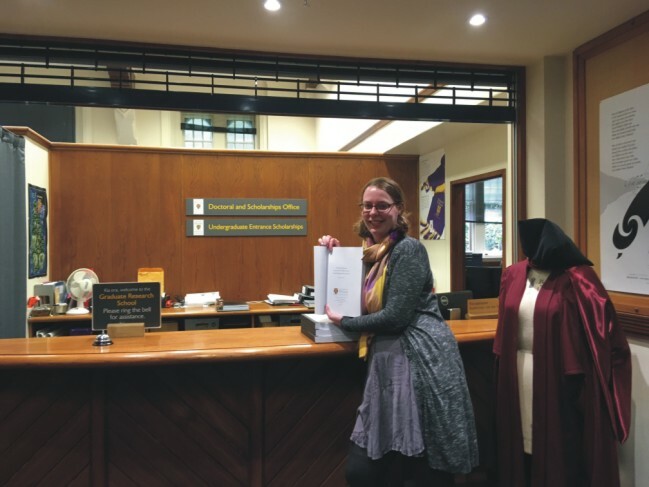 On Friday 24 August 2018 Space Physics PhD student Emma Douma submitted her PhD thesis at the front desk of the Graduate Research School. Her thesis is entitled "Relativistic Electron Microbursts: Properties and Possible Plasma Wave Drivers", and combines satellite and ground-based data. As is clear from the title, it is focused on relativistic electron microbursts, improving our understanding of their properties and drivers. Emma's work has led to three papers (so far). Well done Emma! [24 August 2018]. Emma at the front desk of the Graduate Research School, handing her thesis in for examination! 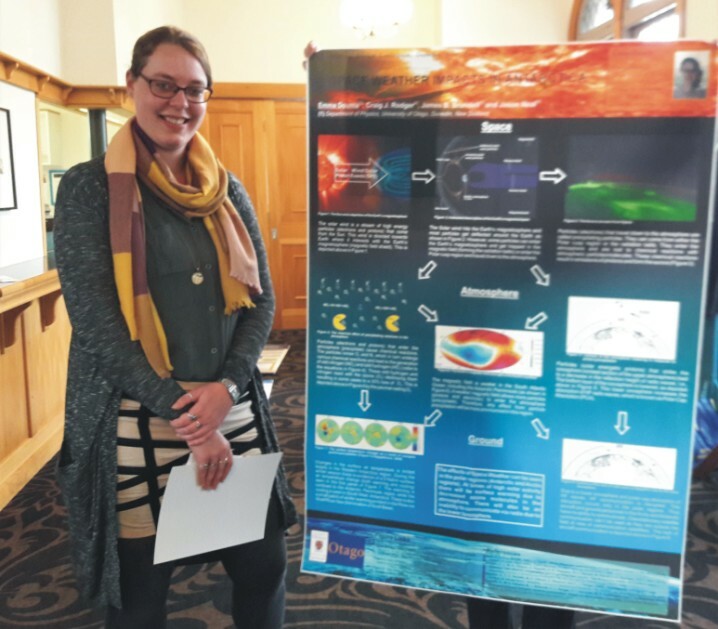 Space Physics PhD student Emma Douma has been awarded first prize at the recent University of Otago Postgraduate Research Poster Competition. The poster she submitted to the competition was entitled "Space weather impacts in Antarctica", and was created for last years Antarctic Science Conference (held in Dunedin). This was a very nice surprise for the group. Congratulations Emma! [8 August 2018]. Emma standing beside her prize winning poster! GIC work declared Editor's Highlight - Twice! Our MBIE funded project on Geomagnetically Induced Currents (GIC) is rapidly coming to an end (the project formally ends at the end of September). In the last few months we have had two examples of good news associated with the project - two different research papers produced due to the MBIE project have been selected as Editors’ Highlights of the American Geophysical Union journal Space Weather [20 July 2018]. The first of these papers was led by Malcolm Ingham (Victoria University of Wellington), exploiting the long Transpower New Zealand GIC database to produce a model of current production - and then estimate the likely peak crrents for an extreme Carrington-class storm (Ingham, M., Rodger, C. J., Divett, T., Dalzell, M., & Petersen, T. . Assessment of GIC based on transfer function analysis. Space Weather, 15. https://doi.org/10.1002/2017SW001707). The paper highlight provides more description. The second of these papers was led by Mark Clilverd (British Antarctic Survey), focusing on the recent very large geomagnetic storm on 7-8 September 2017. Due to the large GIC occurring at Transpower transformers in Dunedin, significant harmonic distortion was produced. This is monitored by Transpower at 10 minute resolution - however, Mark used the wideband VLF receiver we deployed as part of the MBIE project to investigate the harmonic production at higher time and frequency resolution (Clilverd, M. A., Rodger, C. J., Brundell, J. B., Dalzell, M., Martin, I., Mac Manus, D. H., et al. (2018). Long‐lasting geomagnetically induced currents and harmonic distortion observed in New Zealand during the 7–8 September 2017 disturbed period. Space Weather, 16. https://doi.org/10.1029/2018SW001822). The editor highlighted the innovative and powerful nature of the use of the VLF measurements to provide Space Weather context. In early July Craig and Emma left the New Zealand winter and flew to North America. They initially headed to Toronto, to attend the SCOSTEP 14th Quadrennial Solar-Terrestrial Physics Symposium. The next weekend they flew to LA to join the 42nd Scientific Assembly of the Committee on Space Research (COSPAR) in Pasadena. Craig and Emma both presented at both meetings. 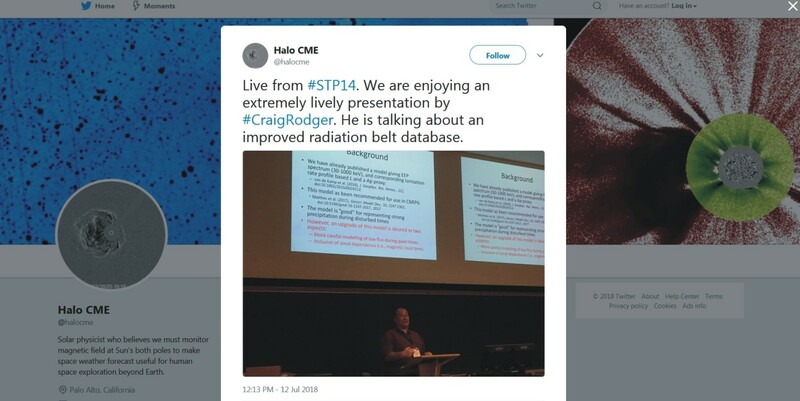 During the first conference, someone decided to tweet and image of Craig, mid-presentation [16 July 2018]. Tweet apparently sent midway through Craig's STP14 presentation. At the second conference, Alexa Halford (now at NASA) tweeted an images and some comments during his Space Weather presentation as well [16 July 2018]. 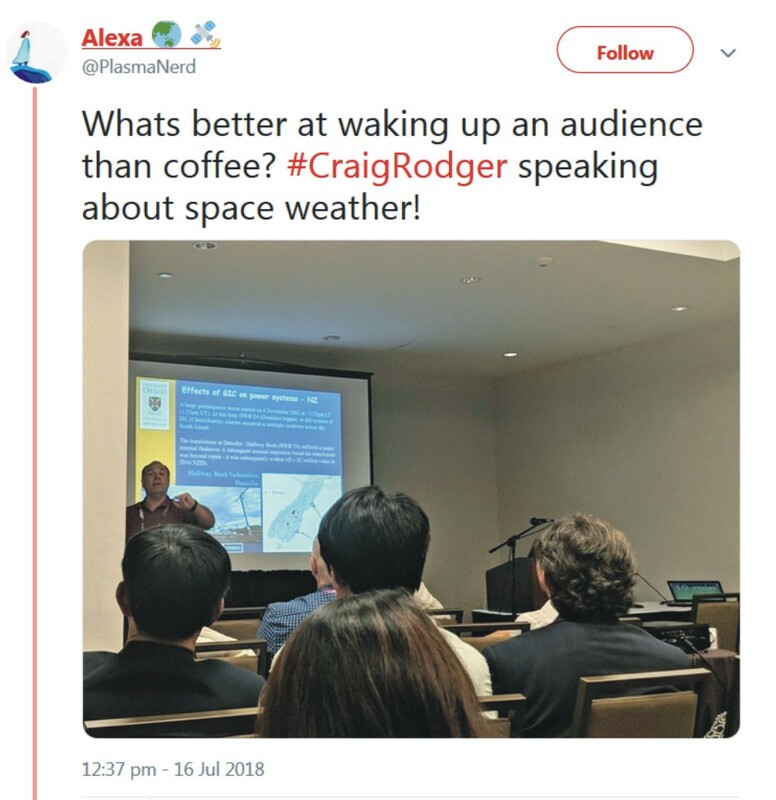 Tweet apparently sent midway through Craig's COSPAR Space Weather presentation. This morning the Otago Space Physics Group's tenth annual Antarctic expedition departed Christchurch for Antarctica. Shortly before take off, Dr. Tim Divett sent us a photo from inside the USAF C-17 transport. 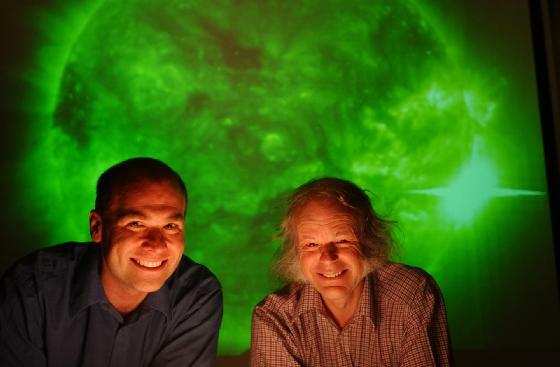 Space Physics Expedition Ten is made up of Tim, and Dr James Brundell. This is Tim's first trip to the ice, and James' ninth. We are particularly pleased to hear they are heading away - due to some mechanical problems Tim and James have been "trapped in Christchurch" through a series of a one day delays. The logistics support, comprising air transport, accommodation, and all other on-ice support is provided through Antarctica New Zealand Event K060. Tim and James will be based at Scott Base, and will work around the base and also up at Arrival Heights. Expedition 10 will gather high resolution data, undertake calibrations and replace the ropes supporting the mast of our Arrival Heights magnetic field loops - those ropes were originally installed in Expedition 1 in late 2008, and are showing signs of wear [4 February 2018]. Back in early October 2017 Aaron submited his PhD thesis for examination. Today that process came to an end - examiners reports arrived, some small revisions were required, and the changes were accepted. 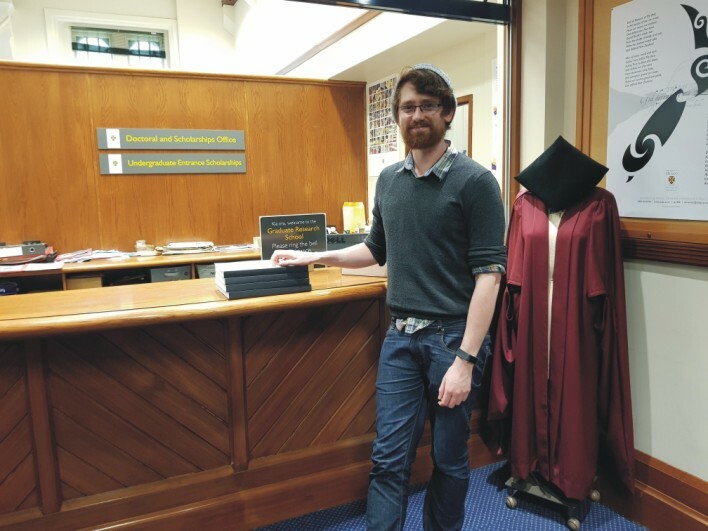 On 8 January 2018 Aaron took the final hardbound thesis over to Registry to hand them over. The examination processes has ended, and we have had confirmation that his thesis had been accepted. His thesis was entitled "Experimental evidence and properties of EMIC wave driven electron precipitation". Aaron cannot use the"Dr" title until he has graduated, but he clearly has won this recognition, except for that formality. Congratulations Aaron! [8 January 2018]. 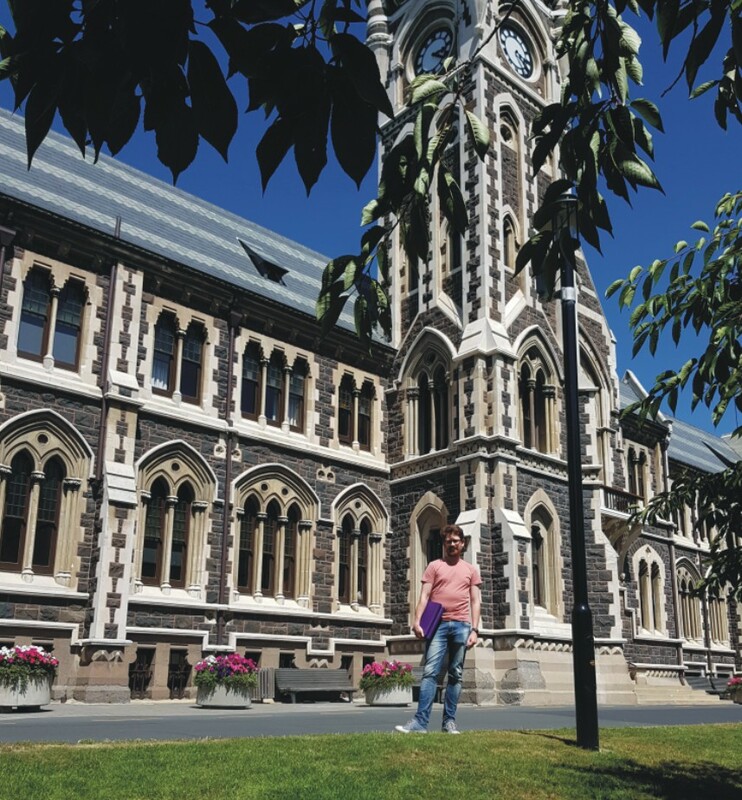 Aaron in front of the University of Otago clocktower, about to enter to hand in the thesis documents he is holding. 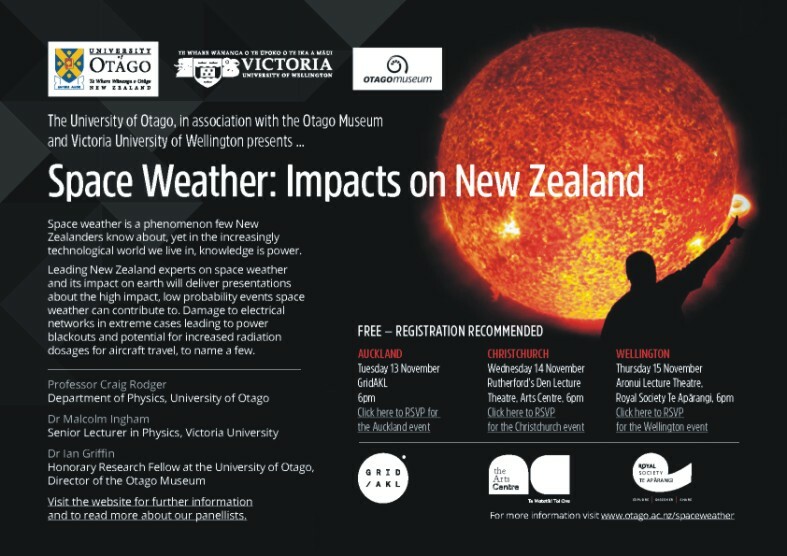 Today the University of Otago and Victoria University of Wellington put out a press release on the impact of geomagnetic storms on New Zealand's technological infrastructure. In particular, the large geomagnetic activity from 7-9 September may have triggered the failure of the fuel pipeline supplying Auckland airport a few days later. You can see the original press release from Otago here, and from Victoria here. A nice story in the New Zealand Herald was published shortly afterwards [24 October 2017]. This is a very special day for the Space Physics group at Otago. 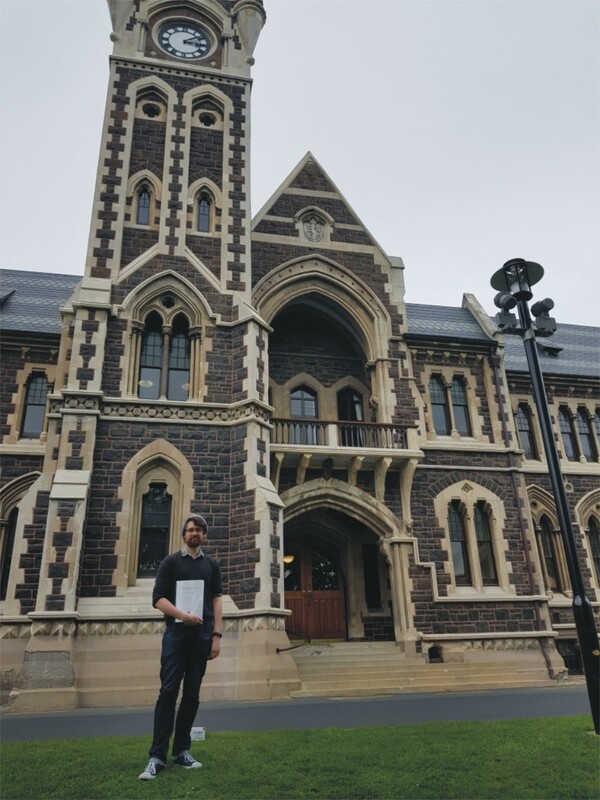 Today PhD candidate and Space Physics student Aaron Hendry walked over to the Graduate Research School in the University clocktower building and submitted his PhD thesis. 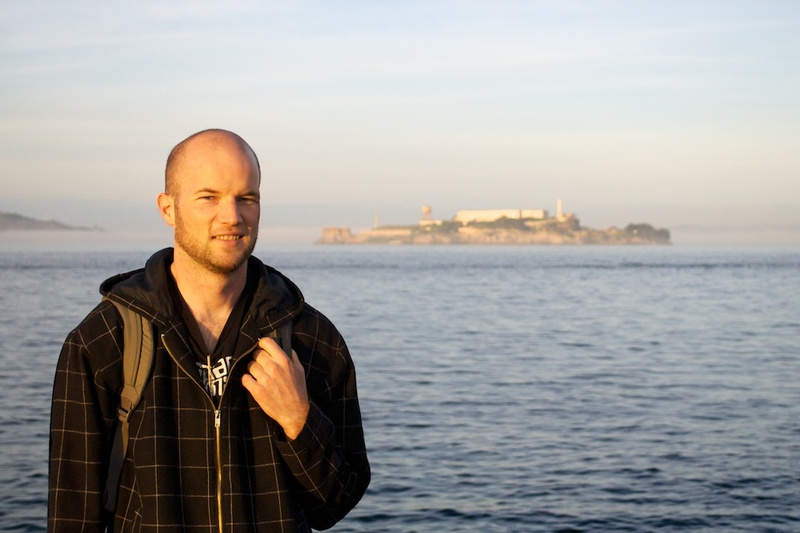 During Aaron's time as a PhD student he produced two first author papers, and co-authored multiple other studies. His work on EMIC wave driven scattering of radiation belt scattering has led to significant new understanding in the field. His thesis was entitled ("Experimental evidence and properties of EMIC wave driven electron precipitation"). Well done Aaron! [6 October 2017]. Aaron at the front desk of the Graduate Research School, handing the thesis over for examination! Recently we were very pleased to have a paper accepted in the American Geophysical Union journal Space Weather. The paper came from our MBIE funded project on the hazard posed by Space Weather events to New Zealand's electrical transmission network. In it we were describing the amazing dataset of DC measurements which have been made and achieved by Transpower New Zealand covering many of the transformers in the South Island - this dataset is well in advance of what many countries posses. Today we learnt that one of the figures from our paper was featured on the cover of the August edition of the journal. The research described in the paper was primarily undertaken by Daniel Mac Manus, then a Space Physics Honours student, working under the supervision of Prof. Craig Rodger. The paper itself can be found online on the space physics website or from the journal itself. The citation is Mac Manus et al. (Space Weather, 15, 1020–1038, doi:10.1029/2017SW001635, 2017) [29 September 2017]. Cover image of the American Geophysical Union journal Space Weather (Volume 15, Issue 8, August 2017, Pages 971– 1090). For the last 3 weeks the Space Physics group has been travelling. 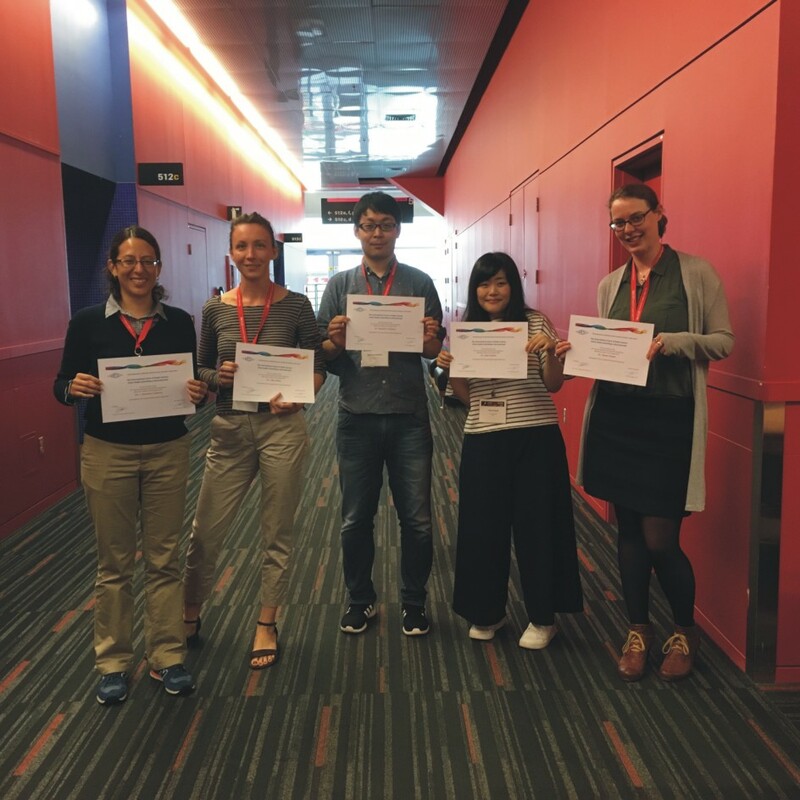 Emma Douma and Craig Rodger went to Montreal to attend the 32nd General Assembly of the International Union of Radio Science (URSI, 19 - 26 August 2017). From Montreal they travelled to Cape Town to be part of the IAPSO-IAMAS-IAGA Joint Assembly (IAGA, 27 August - 1 September 2017), and Tim Divett joined them there coming straight from Dunedin. At the URSI meeting Emma was presented with her URSI Young Scientist Award. This programme supported a number of young scientists to attend the URSI General Assembly and Scientific Symposium. During the IAPSO-IAMAS-IAGA Joint Ceremony there was a special ceremony to present awards from IAGA to five people. 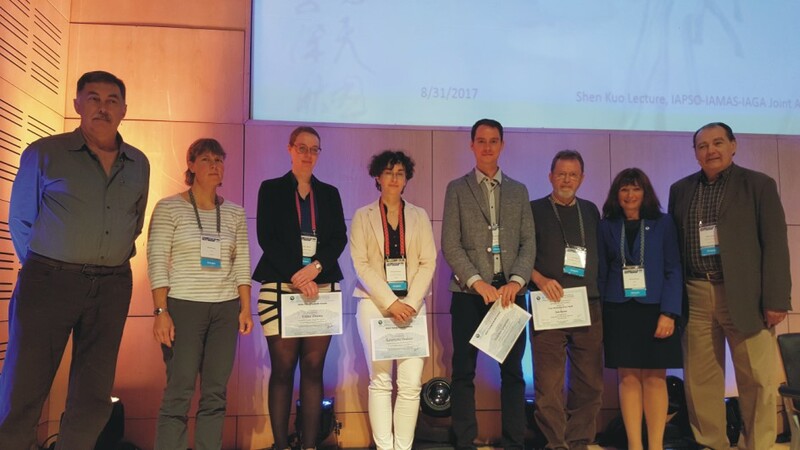 Emma Douma was one of three to receive an IAGA Young Scientist Award for her outstanding student presentation at an IAGA sponsored meeting (in this case the 7th VERSIM workshop in 2016). At both of these major scientific meetings Emma gave invited presentations. Congratulations to Emma [8 September 2017]! IAGA Awards Ceremony, Cape Town, South Africa, on 31 August 2017. Back at the start of 1 June 2017, a new colleague joined the Department of Physics and also Otago's Space Physics Research group. At that point Dr. Annika Seppälä formally started as a new faculty member in our Department. While she is a new academic she is actually well known to our group, having been a collaborator for more than 12 years now! The group is very happy she has left Europe and brought her husband and young son to New Zealand. Belated welcome to Annika, and we hope she will be very happy and productive with us in Dunedin [11 August 2017]. 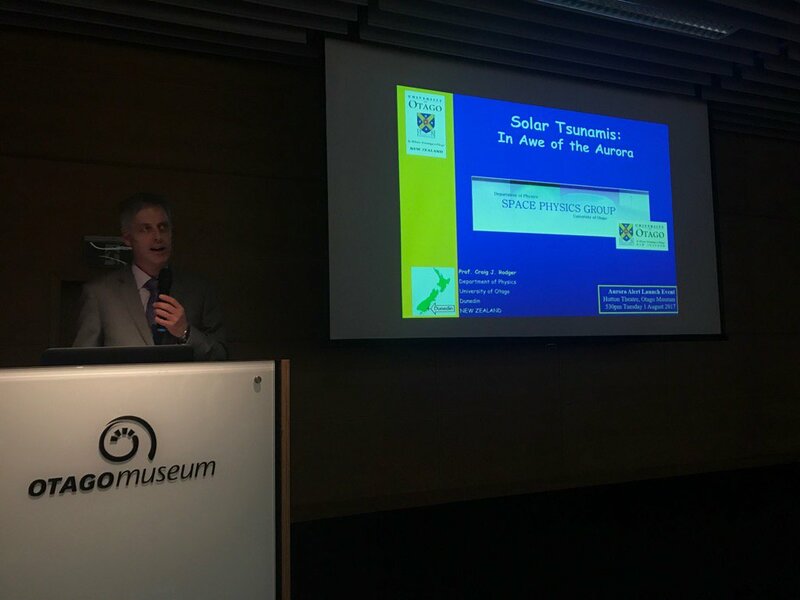 On Tuesday night Otago Museum hosted a set of fully booked public talks entitled Solar Tsunamis: In Awe of the Aurora. Over two hundred people attended, with advice on viewing and photographing the aurora from Dunedin. The Otago University Space Physics research group took this opportunity to inform the public of our new Aurora Alert system, which uses magnetometer measurements to produce a nowcast of aurora activity. The Aurora Alert system was developed with funding support from our MBIE project. The system is designed to alert people in the lower South Island [1 August 2017]. Last week Craig Rodger gave a talk at an artist presentation which ran in central Dunedin city every evening for 2 weeks. The presentation was entitled Sunroom: a space to stare at the Sun. It was the brainchild of visiting Otago Polytechnic design lecturer Trudy Lane and local amateur astronomer Mirko Harnisch. For more information on the Sunroom event see the Otago Daily Times article from 16 June 2017 Great Ball of Fire and The Star article "Space to stare at the sun" [20 June 2017]. For the last few months the Otago Space Physics has been hosting research intern Moritz Wolf, an Engineering Physics student from the Munich University of Applied Sciences. Moritz has been working on an aurora warning system for the Dunedin area, using magnetic field measurements made locally and regionally. Moritz will be leaving us in ~2 weeks, but has now made a system we are testing. Last Friday the system suggested a "level 2" warning on a 9-point scale - which we think corresponds to aurora occurring low in the sky and faint (likely not naked-eye visible), but with a short period of "level 4". Moritz headed off to Sandfly Bay and shot the following stunning movie! Moritz could not see the aurora with his unaided eyes, but others in the Dunedin region could, particularly when it got brightest [25 February 2017]. Today Craig Rodger gave a Director's Choice presentation at the British Antarcric Survey (BAS). In doing so he marked a number of firsts. Not only was he the first non-BAS staff member to give a presentation, he was the first speaker to use the brand new conference room in the "Aurora Cambridge Collaboration Space", which has been built to encourage innovation between BAS and wider industry. Craig spoke on Space Weather, which seems very appropriate given the name of the new rooms. His presentation was entitled And then the Sun went "Bang": An overview of Space Weather research [17 February 2017]. 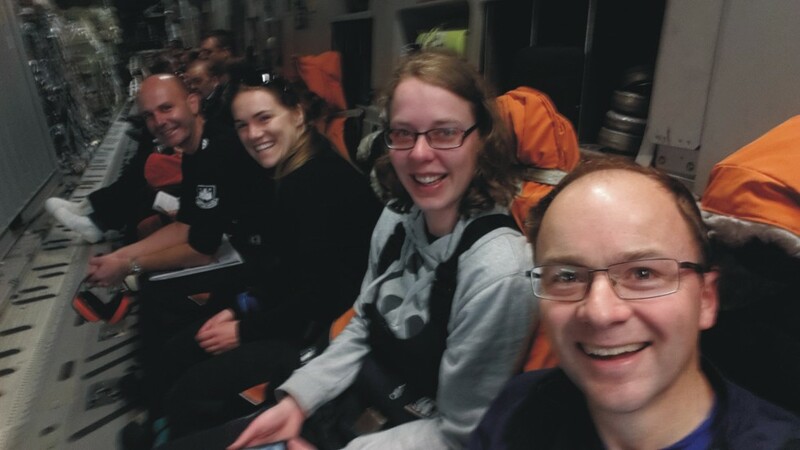 Last Saturday Dr James Brundell and Space Physics PhD student Emma Douma returned to Dunedin from Scott Basem ending the Otago Space Physics Group's ninth annual Antarctic expedition. James and Emma travelled on schedule, and met all the goals of the event. Welcome back! [12 February 2017]. 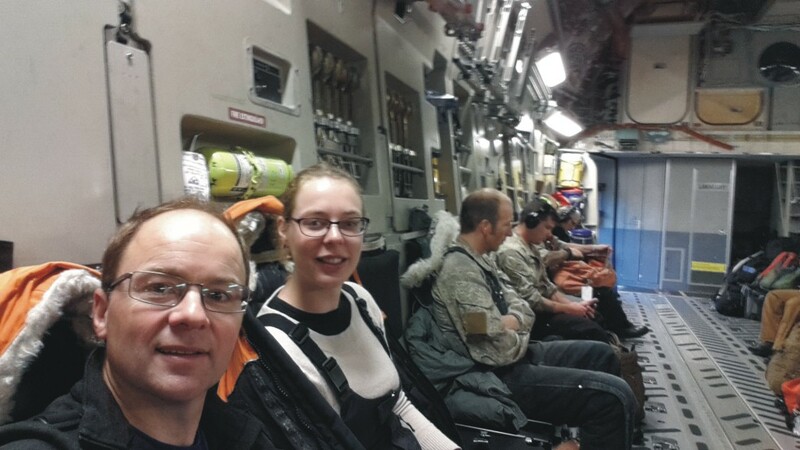 This morning Dr James Brundell sent us a photo taken inside the USAF C-17 transport which would take himself and Space Physics PhD student Emma Douma down to Scott Base. James and Emma were scheduled to take off at 10am, and so should be on the ice mid-afternoon today. This Otago Space Physics Group's ninth annual Antarctic expedition, James' eighth visit to Scott Base, and Emma's second. The logistics support, comprising air transport, accommodation, and all other on-ice support is provided through Antarctica New Zealand Event K060. Expedition 9 will gather high resolution data, undertake calibrations and check the condition of both the Arrival Heights magnetic field loops and the new WWLLN electric field antenna near Scott Base. The new antenna was installed by Expedition 8 in November 2015, and we want to see how it has survived more than a year of continuous exposure. The team will also undertake noise measurements at and around Arrival Heights [1 February 2017]. Not long till take off! The Otago Space Physics Group's ninth annual Antarctic expedition is now preparing to head South. Dr James Brundell is again the on-ice event leader, which will be James' eighth visit to Scott Base in the last nine years! Space Physics PhD student Emma Douma will be travelling with James for her second visit to the Ice. The team is currently scheduled to travel to Scott Base on Monday 1 February 2017 for another 9-day highly intensive working period (planned return is Friday 10 February). The logistics support, comprising air transport, accommodation, and all other on-ice support is provided through Antarctica New Zealand Event K060. This is the first time that the Otago Space Physics Group has sent an expedition down so late in the season, and we are really interested to see how different the conditions will be. Expedition 9 will gather high resolution data, undertake calibrations and check the condition of both the Arrival Heights magnetic field loops and the new WWLLN electric field antenna near Scott Base. The new antenna was installed by Expedition 8 in November 2015, and we want to see how it has survived more than a year of continuous exposure. The team will also undertake noise measurements at and around Arrival Heights [19 January 2017]. 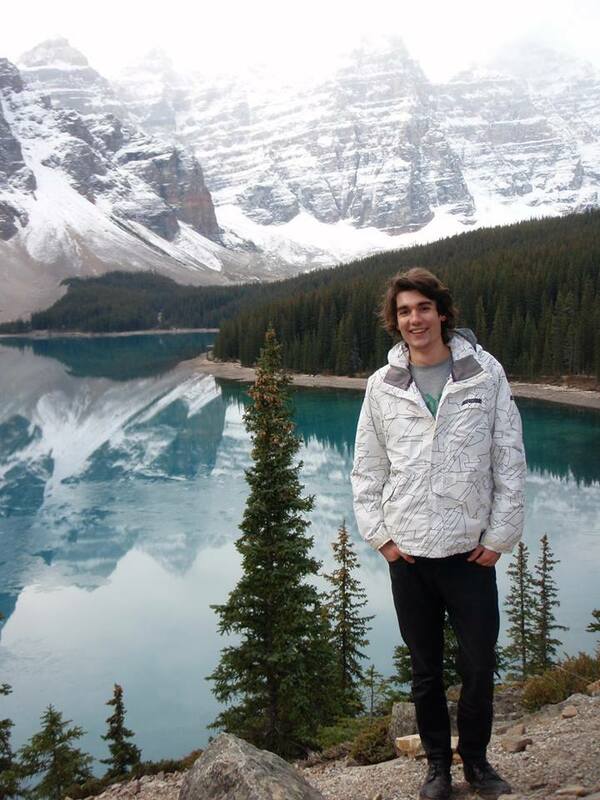 Moritz Wolf has recently joined the Otago Space Physics group as a research intern. Moritz is a student from the University for Applied Science in Munich, Germany. He is studying for a Bachelor Physikalische Technik (Engineering Physics), and will be working with us from mid-October through to March 2017. Before getting to Dunedin Moritz started exploring New Zealand on holiday, and we expect he will keep travelling in the weekends and holidays during his visit. Moritz is working with us on a magnetometer based aurora warning system for the lower South Island [October 2016]. Craig Rodger to give a public talk in South Africa! At the end of next month Prof. Craig Rodger will be giving a public talk for the South African National Space Agency (SANSA). 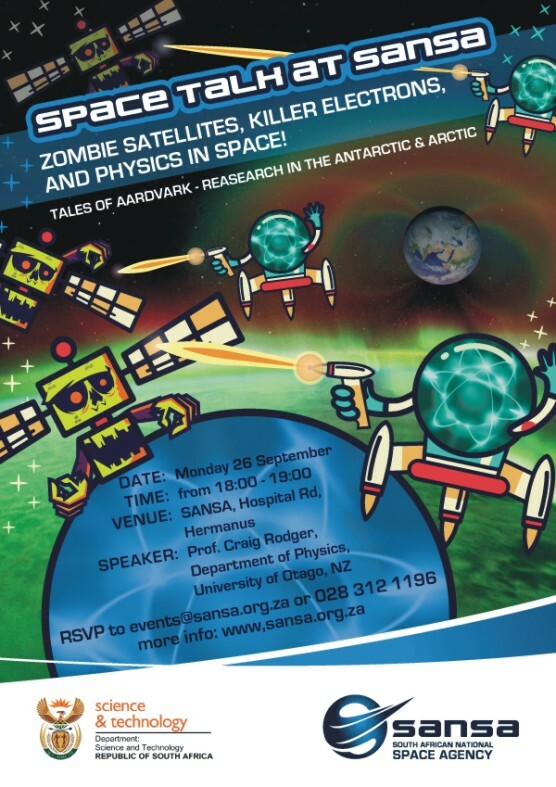 The talk is to be given at SANSA Space Science, which is located in Hermanus in the Western Cape. Craig is travelling to Hermanus to attend the 7th VERSIM workshop, which will be hosted there from 19-24 September 2016. SANSA has produced an eye-catching poster to advertise the event. Craig's talk was recorded, and placed on SANSA's You Tube channel. For the last fortnight we have been hosting 3 visitors from the United Kingdom. 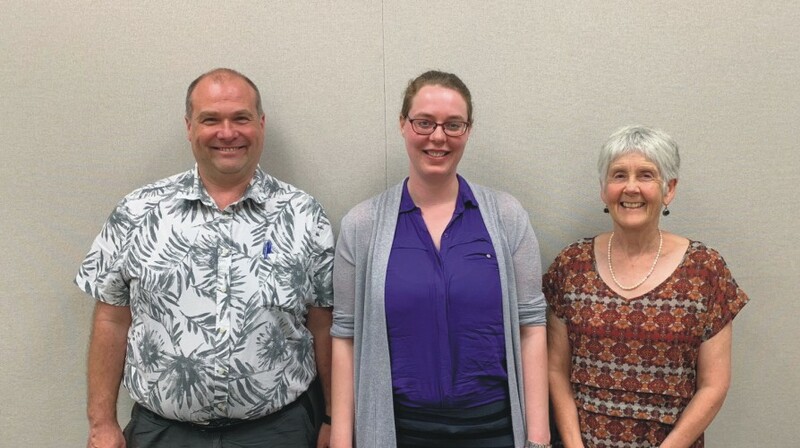 These were Alan Thomson and Ellen Carke (British Geological Survey) from the BGS Geomagnetism team based in Edinburgh and Mark Clilverd (British Antarctic Survey). Their visit was to move forward on our MBIE-funded Geomagnetically Induced Current research project. Alan and Ellen worked with Tim and Craig on the New Zealand GIC measurements, geomagnetic storms, and modelling approaches. Mark worked with James and Craig on the new monitoring equipment and also understanding the GIC measurements. During their visit we hosted the kick-off meeting for our GIC research project, bringing together the New Zealand and UK team members. Alan and Craig also had a really interesting meeting with the Director of Otago Museum, Ian Griffin, about aurora warning. The participants were (left to right): Tim Divett (Otago), Malcolm Ingham (VUW), Daniel Mac Manus (Otago), Neil Thomson (Otago), Alan Thomson (British Geological Survey), Ellen Clarke (British Geological Survey), Craig Rodger (Otago), James Brundell (Otago), Mark Clilverd (British Antarctic Survey), and Mike Dalzell (Transpower). The kick off meeting was on Wednesday 25 May 2016. The day after our kickoff meeting the science show on Radio New Zealand, Our Changing World, broadcast an interview with Craig Rodger about our research work (first broadcast on 26 May). [31 May 2016]. Early this month was the last formal working day of Neil Thomson as a full time member of our Department's academic staff. 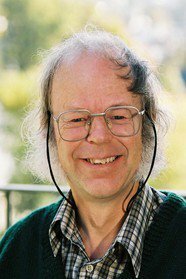 After 38 years of continuous work for the Otago Physics Department Neil took formal retirement on 8 April 2016. In fact, his working life in Physics actually stretches back to when he was first employed by the University as a student demonstrator 52 years ago! Over that time he has been a successful and reliable lecturer, filled many administrative roles across our Department, and produced research that has received worldwide media coverage - and he has also been a highly skilled supervisor of postgraduate students, guiding them to completion. While Neil is retiring, he is not "gone". He is continuing to work on research projects, and is employed part time on our MBIE research project through to late 2018! We are having a Departmental dinner to mark Neil's service near the end of this month [20 April 2016]. Space physics PhD student Emma Douma has been awarded the Edward and Isabel Kidson Scholarship for 2016 (but the funding lasts 3 years). She intends to use the funding support her travelling to international conferences. In 2016 she plans to attend the ISROSES - III (12 - 16 September) meeting in Varna, Bulgaria and hopefully aslo make it to the 7th VERSIM workshop (19 - 23 September) in Hermanus, South Africa [27 January 2016]. At the start of 2016 Space Physics research group leader Craig Rodger became Head of Department of the Otago Physics Department. He takes over from Assoc Prof. Pat Langhorne. This is a 3-year appointment [1 January 2016]. For much of December Craig was back on the road and in the northern hemisphere. In the UK he visited colleagues at the University of Lancaster and then headed north to spend several days talking about Geomagnetically Induced Currents with the geomagnetism team of the British Geological Survey in Edinburgh. 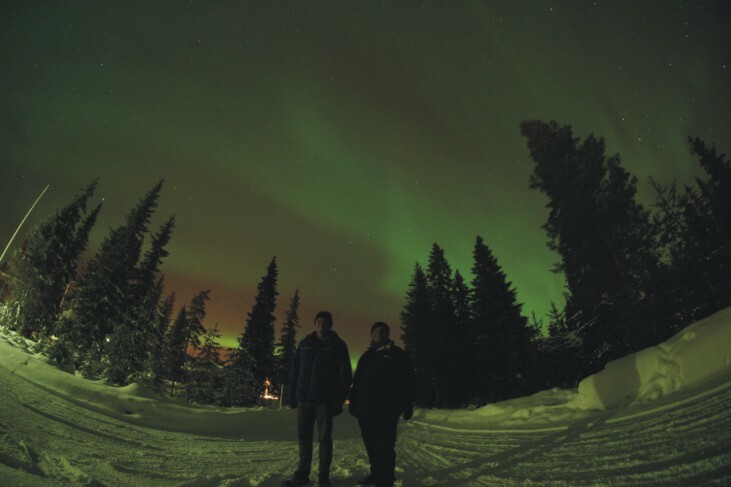 Then Craig headed to Finland to attend the 2015 CHAMOS workshop hosted by the Sodankylä Geophysical Observatory (and saw the aurora!). Finally, he travelled to San Francisco to give an invited talk at the American Geophysical Union Fall Meeting [22 December 2015]. 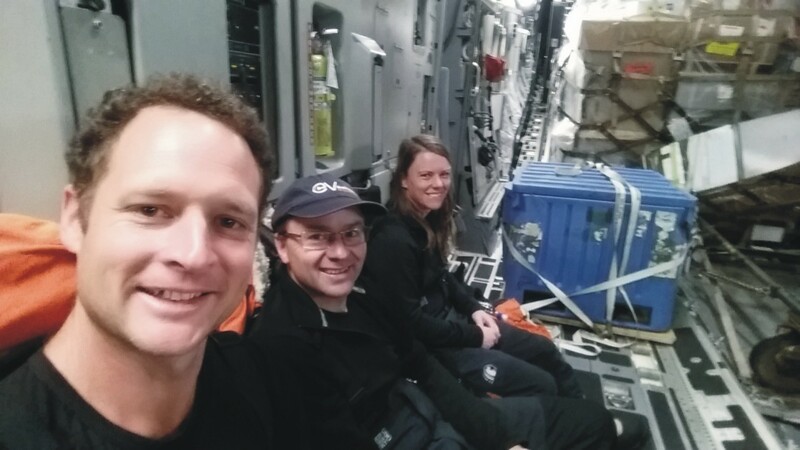 In the early evening of Tuesday 24 November Space Physics PhD student Emma Douma and Dr James Brundell arrived back in Christchurch on a RNZAF C-130 Hercules, returning safely and on schedule from their time at Scott Base. You can read more about thier workplan at this webpage.Their entire trip went as planned, with flights south and north on the days planned - this is especially impressive as there were major travel disruptions during the week they were working on the ice. The following morning Emma and James flew back to Dunedin. Well home Expedition 8! [17 November 2015]. Expedition 8 now working "on the ice"
Last Monday at about 715am Dr James Brundell emailed us a picture from inside the USAF C-17 Globemaster III, shortly before it took off for Antarctica (that is Monday 16 November). James and Space Physics PhD student Emma Douma left on time, and landed at Pegasus Field just a bit after 1pm. By 1:30pm they were on 'Ivan' heading towards Scott Base. Emma and James are now working hard as the two members of Otago Space Physics' Expedition Eight. You can read more about thier workplan at this webpage [17 November 2015]. At the end of his Fulbright New Zealand Fellowship in the USA, Prof. Craig Rodger went from Boulder to Hanover (New Hampshire) to visit Dartmouth College. Dartmouth is one of the oldest universities in the US. Both Otago and Dartmouth are part of the Matariki Network of Universities, and Craig had won an Otago MNU Travel Award to visit Dartmouth. He primarily talked to the space physics researchers there who investigate energetic electron precipitation using balloon-borne X-ray detectors. Craig gave a seminar, and also a Departmental Colloquium. The later presentation was videoed, and has been placed online [13 November 2015]. The eighth Antarctic expedition from the Otago Space Physics group is getting ready for their trip down to the Ice. 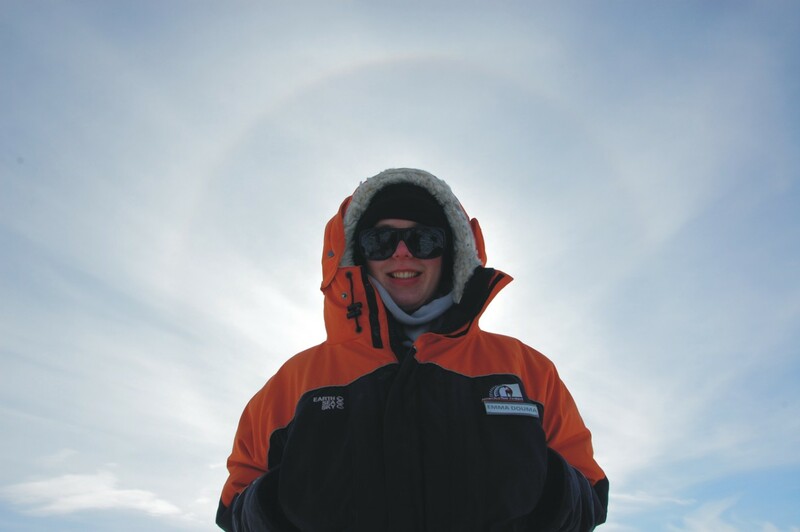 As in previous years, Dr James Brundell is the on-ice event leader (these are the names used by Antarctica New Zealand for the roles we fill), and he will be supported by Space Physics PhD student Emma Douma. The main goal of Expedition 8 is to install a new WWLLN electric field antenna near Scott Base. Previously we have used the AARDDVARK magnetic field antenna located at Arrival Heights to provide data to both AARDDVARK and WWLLN. However, the local magnetic field noise in the VLF frequency range at Arrival Heights has got steadily worse, possibly linked to the Ross Island Wind Farm. During Expedition 6 and Expedition 7 we confirmed that the electric field noise is substantially lower near Scott Base than at Arrival Heights, and thus we should get better measurements from close to base. The team is currently scheduled to travel to Scott Base on Monday 16 November 2015 for another 8-day highly intensive working period (planned to return on Tuesday 24 November). The logistics support, comprising air transport, accommodation, and all other on-ice support is provided through Antarctica New Zealand Event K060. This is James' 7th visit to Antarctica and Emma's first. Expedition Eight will also gather high resolution data, undertake calibrations and check the condition of the Arrival Heights AARDDVARK radio receiver we originally installed in December 2008. You can read more at this webpage [13 October 2015]. Last week Prof. Craig Rodger was a busy soul. Early in the week he left Boulder and travelled south to Houston to give a Space Physics seminar at Rice University. 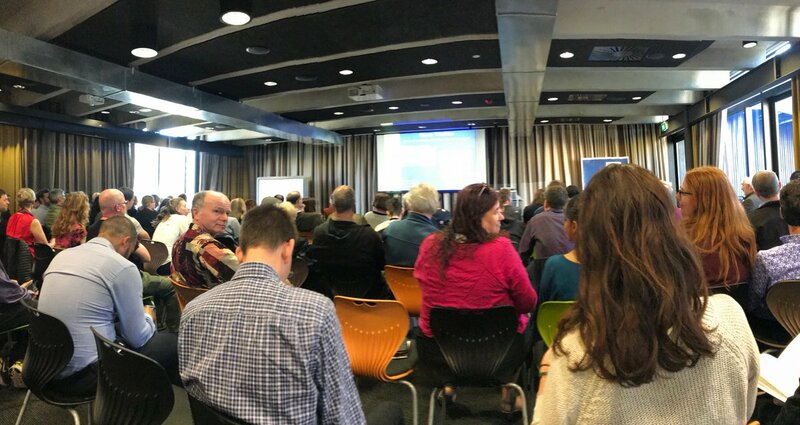 After returning, he gave the inaugural Public Lecture for 2015 at the Laboratory for Atmospheric and Space Physics, Colorado University at Boulder. The public lecture was videoed and is available online from YouTube [12 October 2015]. 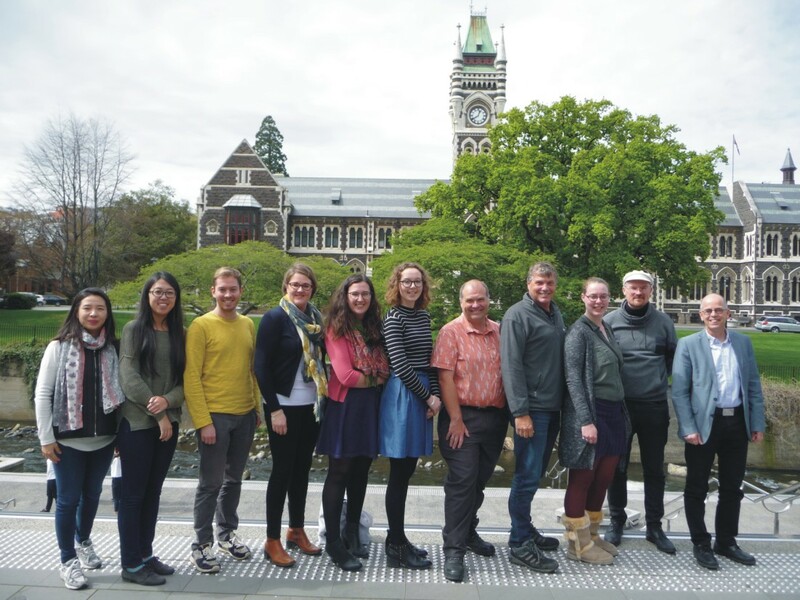 The Otago Space Physics group is currently advertising for a Postdoctoral Fellowship position. This is funded through our recently awarded MBIE project. It is a 2.5-year fixed term position. The project is to investigate the hazard posed by geomagnetically induced currents to the New Zealand electrical transmission network during extreme geomagnetic storms. The successful candidate will build a model to describe geomagnetically induced currents in the New Zealand network. More than 10 years of experimental geomagnetically induced current measurements are available to validate the mproodel, after which the candidate will apply it to investigate the risk posed by extreme geomagnetic storms. The position is available for application from this point, and will remain open until it is filled (the candidate must start at Otago in April 2016). Applicants should have a PhD in Physics and a demonstrated strength in one of the areas of Space Physics, Ionospheric Physics, Geomagnetism, Space Weather and/or Geophysics. For further information, please see the Job Description or the online advertisement [28 September 2015]. The Space Physics research group has been awarded $1,467,000 of funding from a MBIE (Ministry of Business, Innovation & Employment) Targeted Research: Hazards and Infrastructure Research Fund grant in the latest science investment funding round. This grant will support the research of Otago Staff Prof. Craig Rodger, Assoc. Prof. Neil Thomson and Dr. James Brundell, plus Dr. Malcolm Ingham of Victoria University of Wellington for 3-years starting October 2015. We will also be collaborating with Space Weather experts from the British Geological Survey and the British Antarctic Survey, and the power engineers of Transpower New Zealand. Our research will focus on the risk posed by extreme geomagnetic storms to the New Zealand electrical transmission network. 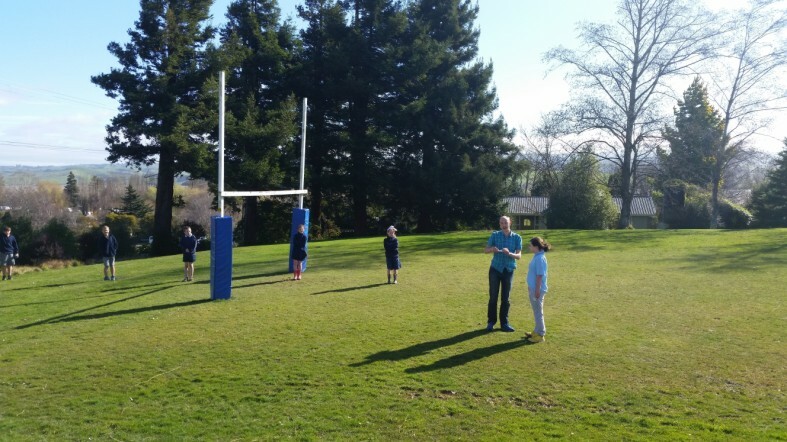 A more detailed description of our project can be found on the Otago news website [3 September 2015]. This week marks the opening of the Art and Light exhibition at Otago Museum. The idea of he display was to mark 2015 as the Year of Light. Dr. James Brundell and Craig Rodger worked with artists David Green and Sarah McKay to inspire three different art installations. One made use of our real-time wideband VLF feed to detect the sferics generated by lightning and project images of lightning on the viewers body. Another used whistler mode chorus recordnigs made by Craig's colleagues at the University of Iowa from their EMFISIS experiment on the Van Allen Probes. Finally, the work by Sarah McKay was inspired by the idea that the radio waves we use are a type of light, but in a range we cannot see with our eyes. A story including descriptions of our work was published in the Otago Daily Times on 17 August 2015 ("Seeing the light"). The exhibition is open from 15-30 August [19 August 2015]. Last week Prof. Craig Rodger flew out of Iowa City to undertake a collaborative visit to the Space Physics researchers at Augsburg College, Minneapolis. While in the twin cities Craig went to see colleagues at the University of Minnesota. 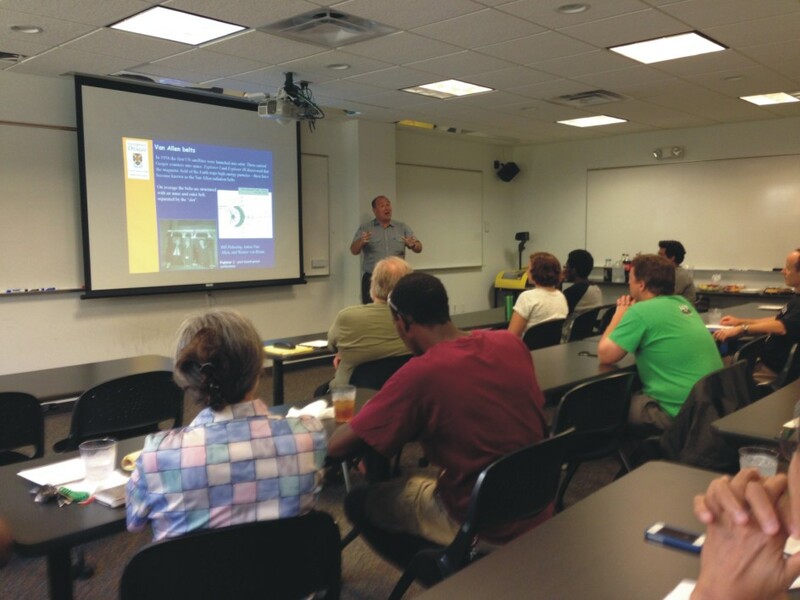 He also gave a colloquium to staff and students from Augsburg College, with some visitors from the University of Minnesota who came across the river for the talk [10 August 2015]. This week Prof. Craig Rodger travelled from Iowa City to Columbia (Maryland) to attend a set of meetings at the Applied Physics Laboratory of Johns Hopkins University. This was a multi-day set of meetings around NASA's Van Allen Probes. The first day was devoted to Instrument Team Meetings, and Craig have a presentation at the EMFISIS team meeting. After this Craig was part of the wider Science Working Group workshop. He was supported by EMFISIS funds from the University of Iowa and the Fulbright New Zealand Scholar Award which is reported below [30 July 2015]. 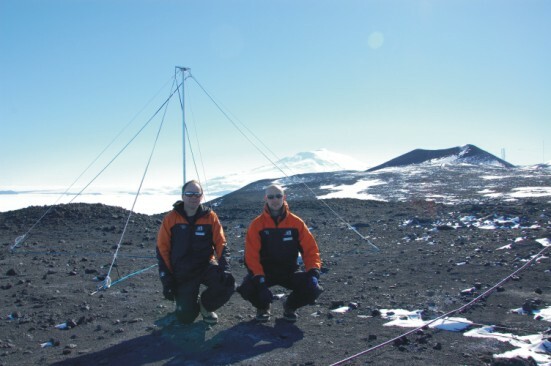 Otago Space Physics team contributes to interview on "mini ice age"
This month's edition of Physics World magazine includes an article about whistlers recorded in Dunedin that were produced by Alaskan volcanic eruption-triggered lightning. There has been quite a lot of interest in volcanic lightning in the last few years, and World Wide Lightning Location Network (WWLLN) observations are now being used to provide early warnings of eruptions (one of the WWLLN central processing computers is hosted at Otago, and we operate 3 WWLLN receivers around the world). South African MSc student Claire Antel (University of Cape Town) used whistler observations from Dunedin, collected by the Eötvös University Automatic Whistler Detector (AWD) we host, and combined them with WWLLN lightning to show some of the Dunedin-reported whistlers were being generated from the volcanic lightning! The research was originally published as a paper in Geophysical Research Letters (doi:10.1002/2014GL060332, 2014), and has now been described in this Physics World magazine article (requires subscription) and the associated press release. 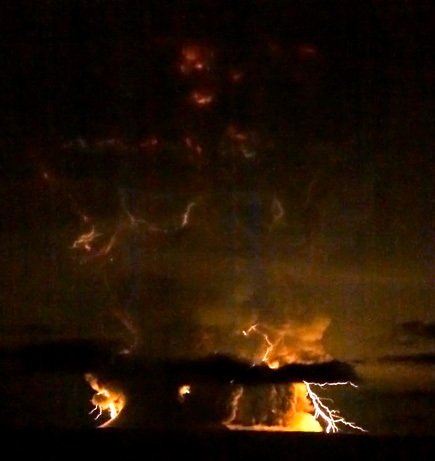 The article is called "Whistling volcanoes", but the prize clearly goes to the title of the press release: "Flashes in the ashes: How volcanic lightning is helping to demystify the Earth’s plasmasphere" [3 July 2015]. Lightning over Alaska's Redoubt Volcano during the March 2009 eruption. Otago Space Physics "Hits the Road"
This week the entire Space Physics group is travelling for work, but mostly not together! Prof. Craig Rodger left the University of Iowa (USA) where he is reseacrhing supported by a Fulbright New Zealand Scholar Award and travelled to Prague (Czech Republic) to represent New Zealand at the 26th IUGG General Assembly. Assoc. Prof. Neil Thomson is in Canada and Denmark to undertake a set of field campaign measurements. PhD student Aaron Hendry, who was working British Antarctic Survey (UK), finished his European holiday and arrived in Prague to join Craig at the IUGG conference. 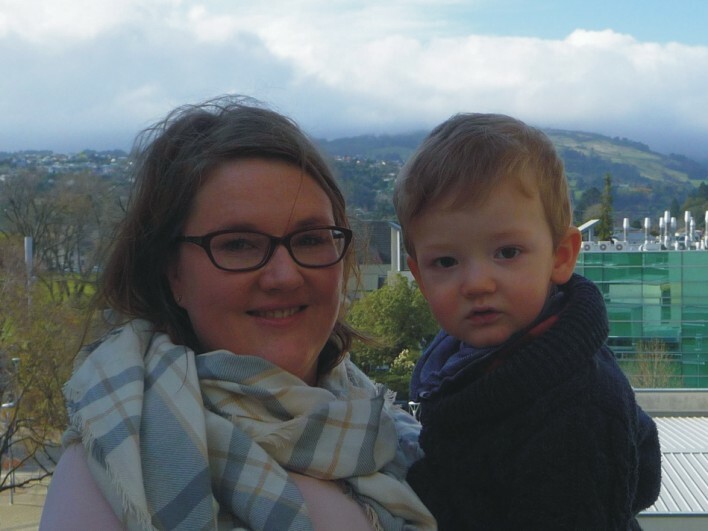 PhD student Kathy Cresswell-Moorcock left Dunedin for Boulder (USA) to take part in the NCAR Advanced Study Program Summer colloquium entitled Climate, space climate, and couplings between. And this week Dr. James Brundell and PhD student Emma Douma went to Christchurch (New Zealand) to attend the 2015 Antarctic Science Conference. It must feel very quiet in the Space Physics lab space [1 July 2015]. Prof. Craig Rodger was awarded a Fulbright New Zealand Scholar Award to spend time working and living in the USA. He left New Zealand last week (28 May), and is now in Iowa City. The Fulbright Scholar 5-month period is split between the University of Iowa in Iowa City and the University of Colorado in Boulder. Craig will spent about 6-months in the USA on sabbatical, so after the Fulbright period he will also travel to Hanover to visit Dartmouth College supported by a Matariki Network of Universities' (MTU) Travel Award [5 June 2015]. 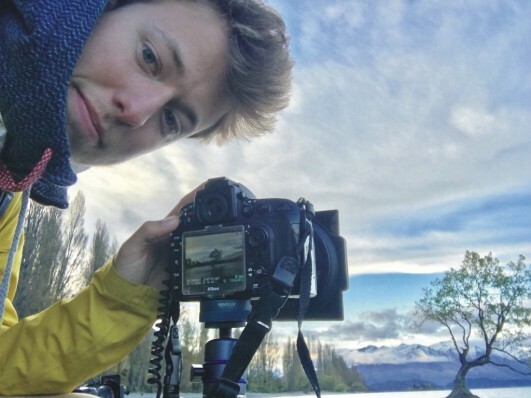 Space Physics PhD student Aaron Hendry left New Zealand on Friday 22 May 2015 to undertake a collaborative visit to the British Antarctic Survey. He is working with our long-term collaborator Dr. Mark Clilverd to better understand EMIC-driven electron precipitation into the atmosphere, combining satellite and ground based data. Both magnetometer and AARDDVARK data are being used. Aaron is supported by a Claude McCarthy Fellowship. He will also take a holiday while in Europe, and attend the 26th IUGG General Assembly in Prague [5 June 2015]. 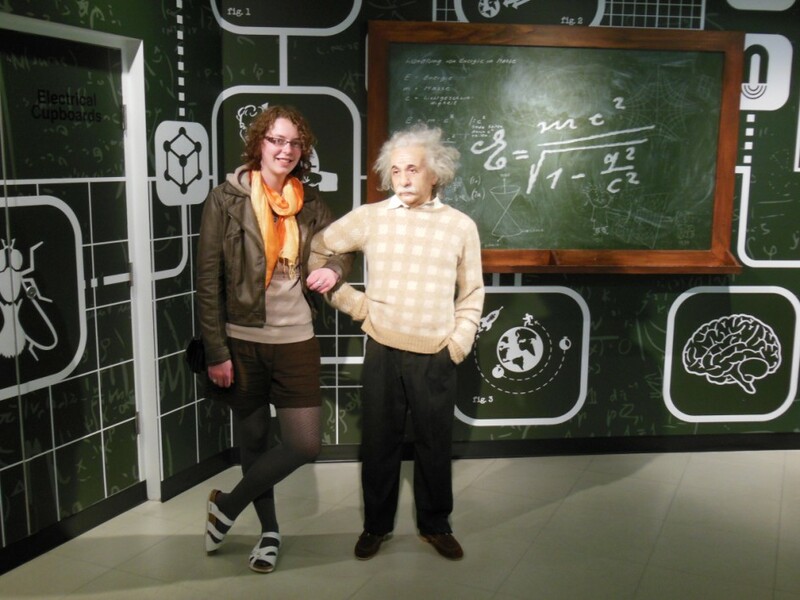 Emma Douma will be pursuing a PhD in the Space physics group, attempting to understand strong diffusion. She has been awarded the prestigious Fanny Evans Postgraduate Scholarship for Women and started working towards her PhD on the 1st of March. Emma didn't really leave the group, as she undertook her Honours project research with us in 2014, and was then a summer fellowship research student [25 March 2015]. 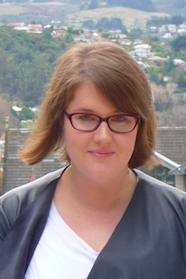 Space Physics MSc student Kathy Cresswell-Moorcock has recently won a University of Otago Doctoral Scholarship to cover three years of study for her PhD. She is staying with the Otago Space Physics group for this study which started in December 2014. Kathy also graduated with her Masters of Science awarded with Distinction on 13 December 2014 [25 March 2015]. Prof. Craig Rodger heard today that he been recommended by the editors of Journal of Geophysical Research: Space Physics to receive the 2014 Editors' Citation for Excellence in Refereeing. JGR - Space Physics is published by the American Geophysical Union. The citation reads "One of the most important services performed for AGU is the conscientious reviewing of submitted papers. Because of the nature of the reviewing process, this service is also one of the least recognized. The purpose of this citation is to express publicly the gratitude of AGU to those whose reviews have been particularly commendable." A photo and formal annoucement is to be published in a future issue of AGU's Eos Earth & Space Science News [13 March 2015]. On the last day of February Prof. Craig Rodger travelled to Norway to take part in the 5th Birkeland Centre for Space Science meeting at the University Centre in Svalbard (UNIS), Longyearbyen, Svalbard. Svalbard is a Norwegian archipelago in the Arctic Ocean located about 2000km north of Oslo. 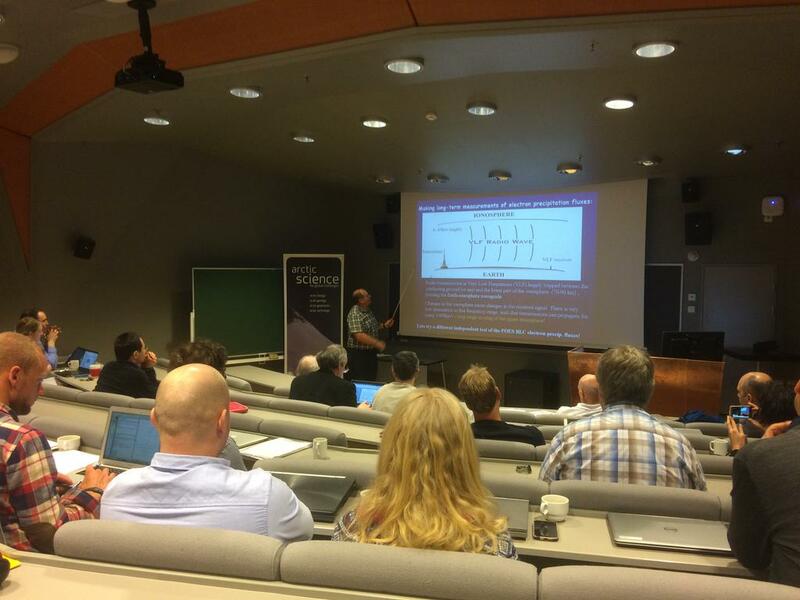 Craig gave the plenary lecture at the 5th BCSS workshop on Tuesday 3 March 2015 at UNIS which was carried on the twitter feed of the Birkeland Centre. Craig combined his visit to Norway with travels to the British Geological Survey in Edinburgh and Physics at Lancaster University [3 March 2015]. Craig giving his plenary lecture at the 5th BCSS meeting. Each year Mark Clilverd from the British Antarctic Survey comes to visit the Otago Space Physics group - this very long-standing collaboration has produced a lot of science, and influenced a lot of student projects. In 2015 Mark came to us for two weeks in early-mid January - at the height of a truly wonderful Dunedin summer. We celebrated his birthday with penguin spotting at the Kaitiki Point Penguin colony and have enjoyed working on our laptops in Craig's garden. Mark has also worked strongly alongside the groups 3 PhD students (Aaron, Kathy and Emma). Its been a highly productive visit with two papers finished off and another one started. We are sorry to see Mark leave, but he now heads away to Switzerland to attend a meeting at the International Space Science Institute. [23 January 2015]. The seventh Antarctic expedition from the Otago Space Physics group returned to Dunedin on Thursday after a very productive week on the ice Prof. Craig Rodger and Dr. James Brundell left on the scheduled day, and returned to Christchurch only ~5 hours later than planned. They spent almost exactly one week in Antarctica, in an intensive mission to repair the AARDDVARK antenna located near Scott Base. This year the weather was kind, giving them a lot of good quality working time [20 November 2014]. Energetic electron precipitation (EEP) from the Earth’s outer radiation belt continuously affects the chemical composition of the polar mesosphere. EEP can contribute to catalytic ozone loss in the mesosphere through ionization and enhanced production of odd hydrogen. However, the long-term mesospheric ozone variability caused by EEP has not been quantified or confirmed to date. We recently showed in Nature Communications, using observations from three different satellite instruments, that EEP events strongly affect ozone at 60–80 km, leading to extremely large (up to 90%) short-term ozone depletion. This impact is comparable to that of large, but much less frequent, solar proton events. On solar cycle timescales, we find that EEP causes ozone variations of up to 34% at 70–80 km. With such a magnitude, it is reasonable to suspect that EEP could be an important part of solar influence on the atmosphere and climate system. The Nature Communications article was the result of a collaboration between the Finnish Meteorological Institute, University of Otago and British Antarctic Survey. The article produced press releases from FMI and Otago University, and lead to a number of articles in news papers, including the Otago Daily Times and the New Zealand Herland. Craig was interviewed on National Radio, which can be listened to online [17 October 2014]. The seventh Antarctic expedition from the Otago Space Physics group is preparing for their trip South. Prof Craig Rodger is the event manager for Expedition 7, while Dr James Brundell is the event leader (these are the names used by Antarctica New Zealand for the roles we fill). The main goal of our travel is to repair long-term damage to our antenna, which was been in place since December 2008 but has slowly suffered in the high winds at Arrival Heights. The team is currently scheduled to travel to Scott Base on Wednesday 12 November 2017 for a 7-day highly intensive working period. The logistics support, comprising air transport, accommodation, and all other on-ice support is provided through Antarctica New Zealand Event K060. 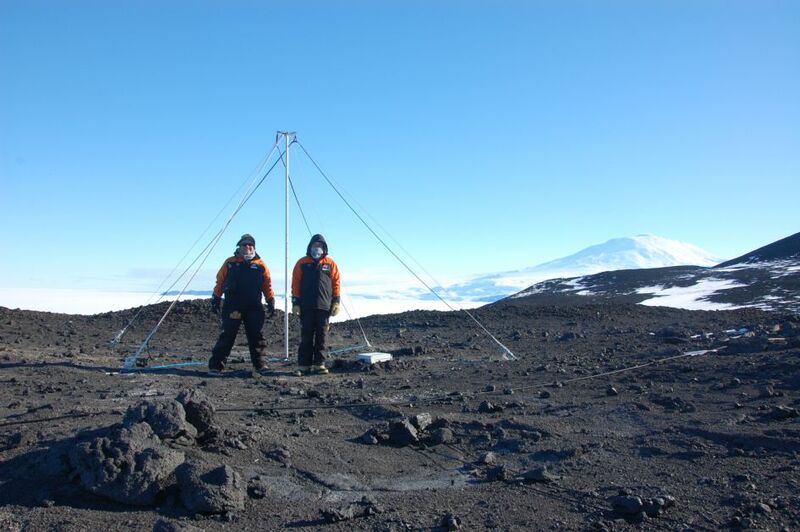 James and Craig are heading to Scott Base to work on Otago's AARDDVARK radio receiver which is located at Arrival Heights, not far from Scott Base. 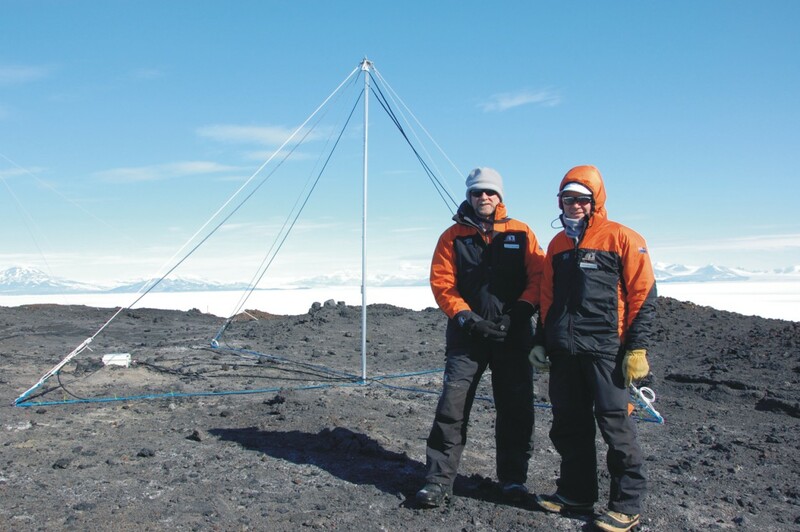 They also comprised the Expedition One team who deployed this radio receiver in December 2008; this is James' 6th visit to Antarctica and Craig's third. Expedition Seven will also gather high resolution data, undertake calibrations and make VLF radio noise observations. While planning is well underway, both Craig and James have a few other tasks to complete first – Craig leaves to China this Friday and then will travel to Finnish Lapland, while James is currently in Brazil having attended the V Brazilian Symposium on Space Geophysics and Aeronomy & IV Forum for Research and Innovation. Interested? You can read more at this webpage [9 October 2014]. Last Friday Space Physics group PostDoc Dr Ian Whittaker and Prof. Craig J. Rodger headed to Europe. They travelled to Hungary to take part in the close down meeting of the EU FP7 PLASMON project. The close down meeting was held in the ELTE Professors Klub in Budapest and the Hotel Salgo near Somoskőújfalu (whcih is located just south of the Slovakian boarder). [10 July 2014]. Congratulations to Space Physics MSc student Kathy Cresswell-Moorcock who recently handed in herMSc thesis! The thesis was entitled "Techniques to Determine Quiet Day Curves for Subionospheric VLF Observations". Kathy's MSc research was part of our Marsden Funded research project into energetic electron precipitation, and involved determinig the ambient or "background" patterns in subionospheric propagatuion data. She was supported the Marsden Fund [4 July 2014]. 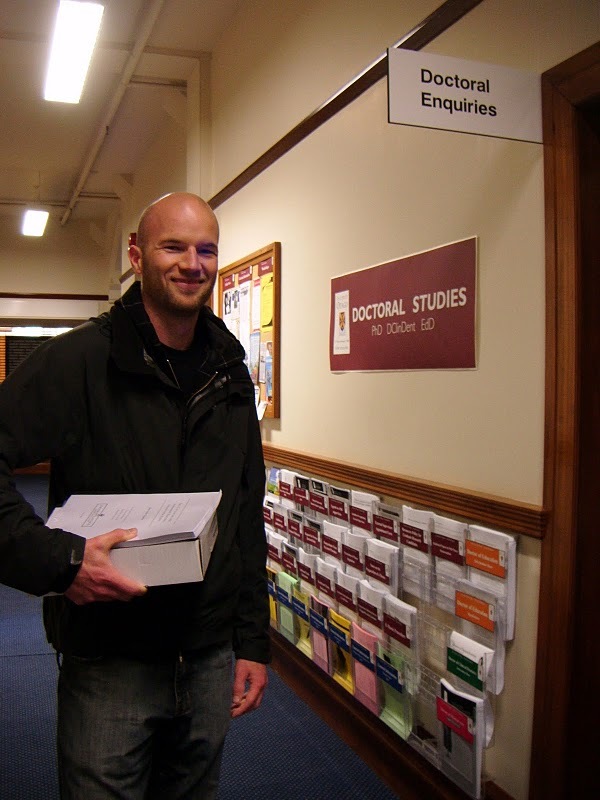 Congratulations to Space Physics MSc student Jason Neal who has now handed in his MSc thesis! The thesis was entitled "Long-term Determination of Energetic Electron Precipitation into the Atmosphere Using Subionospheric VLF Perturbations". Jason's MSc research was part of our Marsden Funded research project into energetic electron precipitation, and involved extracting precipitation fluxes from AARDDVARK-network observations. 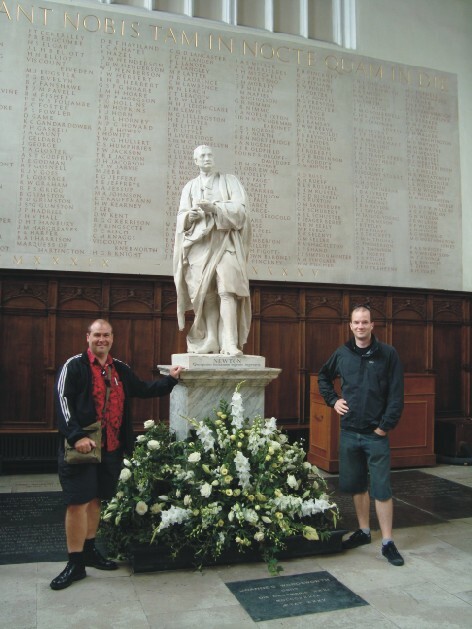 He was supported by a University of Otago MSc Scholarship and the Marsden Fund [4 June 2014]. 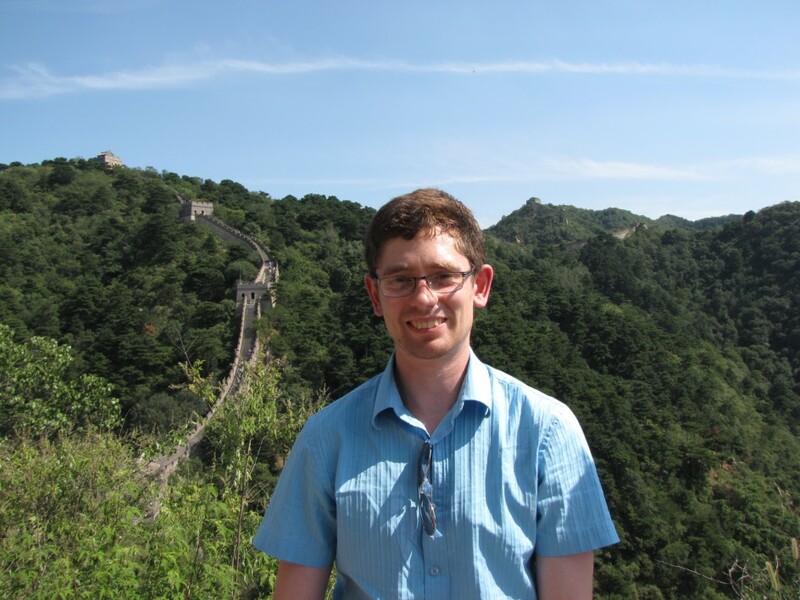 This morning we learnt that Space Physics PhD student Aaron Hendry has been selected to receive an URSI Young Scientist Award to attend the XXXI URSI General Assembly and Scientific Symposium at the Beijing Convention Center (BCC) in Beijing, China, from 16 to 23 August 2014. This award will cover his registration, accommodation, and food, plus bring him to some social events (the URSI Young Scientists party). 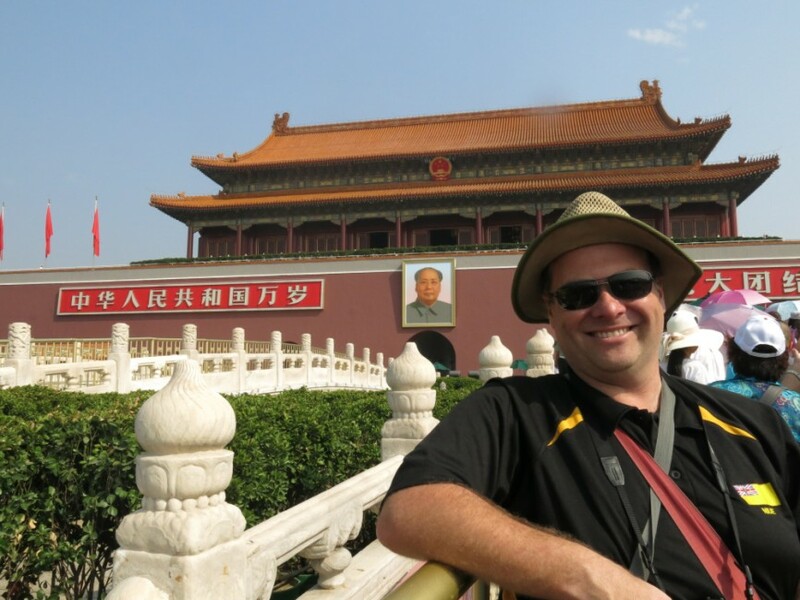 Craig is also travelling to this conference in Beijing, as the official New Zealand delegate. Our group has sent staff and students to all the URSI General Assemblies which have occurred for several decades, and Aaron is in a proud line of Young Scientist Award winners from the Otago Space Physics Group. Well done Aaron! [4 June 2014]. This Friday Dr James Brundell and Prof. Craig J. Rodger will be heading to Canada to visit some of the AARDDVARK receiver sites. We will go to St John's initially, to the AARDDVARK receiver there which is on the site of the St. John's Magnetic Observatory. After a couple of days working there we will travel to Ottawa (visiting Natural Resources Canada Space Weather Forecast Centre), then Edmonton (Space Physics Group at the University of Alberta). At this point we split up. Craig will head to Calgary (visiting the University of Calgary), while James will leave Canada and go to Seattle (visiting the University of Washington's Department of Earth and Space Sciences). As part of this trip we will be returning to the Ministik Lake AARDDVARK antenna which has certainly had a very hard life. Since our last visit in July 2013 (see the news bulletin below) the data quality has been pretty good, but it has continued to be a somewhat mid-behaved [15 May 2014]. Craig was filmed back in late March 2013 by a team from the New Zealand Science Learning Hub, who were putting together a new resource called "Gases and Plasmas". The Science Learning Hub provides resources for teachers of school years 2-10 and is funded by the Ministry of Business, Innovation and Employment. The Gases and Plasmas context includes multiple content from the Space Physics group, including radiation belt and space weather research, Red Sprites, our WWLLN lightning research, and overviews on plasmas and studying Physics. And more, actually [29 April 2014]. Last Friday (25 April 2014) Space Physics group PostDoc Dr Ian Whittaker left from Auckland airport to attend the European Geosciences Union General Assembly 2014 in Vienna (17 April -2 May). Ian will be travelling in Europe after the meeting, including in Switzerland and the UK. 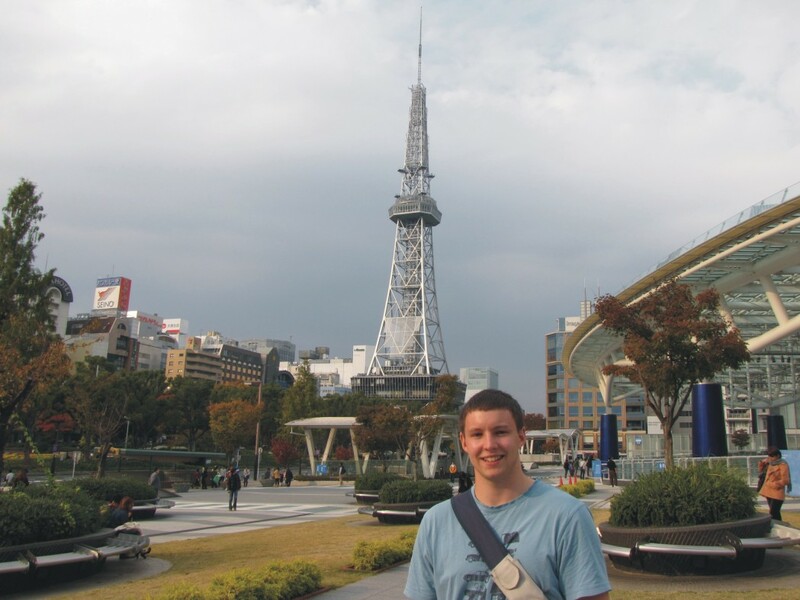 The next day Space Physics PhD student Aaron Hendry left from Auckland airport to attend the Japan Geoscience Union Meeting 2014 in Yokohama (28 April - 2 May), after which he will travel in Japan. Both are giving oral presentations at these major conferences. Busy times for the group! [27 April 2014]. Each year Mark Clilverd from the British Antarctic Survey comes to visit the Otago Space Physics group - this very long-standing collaboration has produced a lot of science, and influenced a lot of student projects. 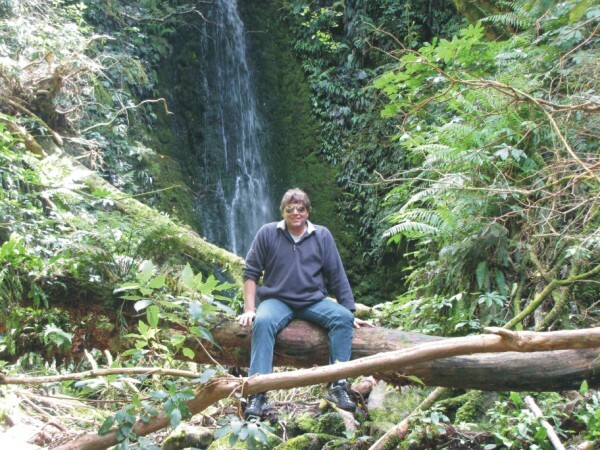 This year Mark came to Dunedin for more than 3 months, having a sabbatical" in our group. All of the Space Physics group, staff and students, worked alongside Mark in this time period - a bunch of our scientific questions have been clarified. But now Mark is heading homewards, leaving us on Monday next week [7 April 2014]. Scientific Committee on Solar Terrestrial Physics (SCOSTEP) launched its new scientific program VarSITI (Variability of the Sun and Its Terrestrial Impact) on Monday 13 January 2014. VarSITI is an international interdisciplinary research program that will run for next five years. The VarSITI program is established after a collective effort by the international scientific community over the past year. It will focus on four major themes: solar magnetism and extreme events, Earth impacting solar transients, magnetospheric changes, and consequences and processes in Earth's atmosphere. In order to make progress on these themes, four scientific projects have been defined, which are headed by international experts. 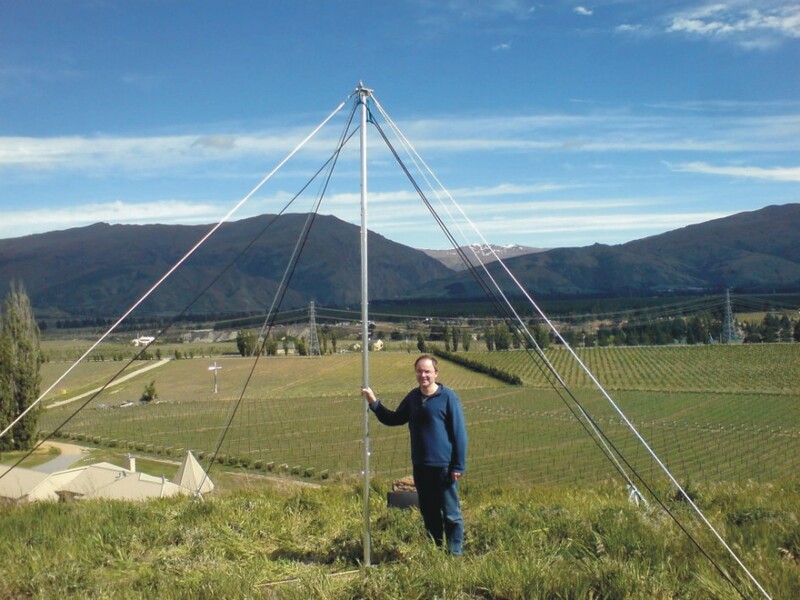 One of the 4 projects inside the VarSITI programme is SPeCIMEN (Specification and Prediction of the Coupled Inner-Magnetospheric Environment), which is lead by Otago academic Assoc. Prof. Craig J. Rodger and UCLA-researcher Dr. Jacob Bortnik. More details at the VarSITI website, the SCOSTEP website, or from this YouTube movie associated with the VarSITI programme launch [13 January 2014]. Craig Rodger promoted to Professor! Late in 2013 the University of Otago annouced that two Physics Department staff were being promoted to Professor, included Craig Rodger. The full details on their promotions and the other Otago staff joining them in their new role can be found in the University Media Release [23 December 2013]. The sixth Antarctic expedition from the Otago Space Physics group returned to Dunedin on Sunday after a cold time. While Dr. James Brundell and Space Physics PhD student Aaron Hendry. While theywere expected to come back to New Zealand on the Wednesday before, a series of weather-related delays kept them on the ice for several extra days. Nonetheless, they made it home, safe and well. Craig received a text message confirming this as he, Kathy and Jason were taking the train away from Najoya airport, Japan (see previous item) [17 November 2013]. Tomorrow a group of us leave Dunedin, heading for the International CAWSES-II Symposium in Nagoya, Japan. Space Physics MSc students Kathy Cresswell-Moorcock and Jason Neal along with Assoc. Prof. Craig Rodger have multiple presentations to give over the 5-day meeting. Jason and Kathy have not been out of New Zealand before, so this is a very exciting opportunity [14 November 2013]. The sixth Antarctic expedition from the Otago Space Physics group is preparing for their trip South. Dr James Brundell, the event leader, has been preparing with Space Physics PhD student Aaron Hendry. They will be testing new monitoring equipment as we investigate the possibility of new recording sites around Ross Island. The team is scheduled to travel to Scott Base on Monday 4 November 2013 for a ten-day intensive working period. The logistics support, comprising air transport, accommodation, and all other on-ice support is provided through Antarctica New Zealand Event K060. 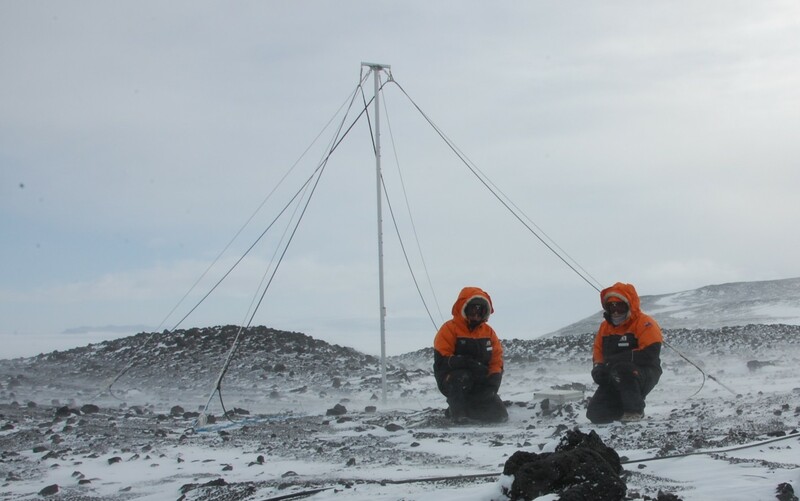 James and Aaron are heading to Scott Base to work on Otago's AARDDVARK radio receiver which is located at Arrival Heights, not far from Scott Base. James was one of the two man Space Physics team who deployed this radio receiver in December 2008, and has returned multiple times since. The main aim for Expedition 6 is check the VLF radio noise for sites near Scott Base, in case we need to move from our existing recording site near New Zealand lab at Arrival Heights. James and Aaron will also gather high resolution data and undertake calibrations and physical maintenance of the experiment. Interested? You can read more at this webpage [29 October 2013]. This Friday Dr James Brundell and Assoc. Prof. Craig J. Rodger will be heading to Canada and Seattle to visit some of the AARDDVARK receiver sites. We will go to Ottawa initially (visiting Natural Resources Canada Space Weather Forecast Centre), then Edmonton (Space Physics Group at the University of Alberta) and finally fly south to Seattle (visiting the University of Washington's Department of Earth and Space Sciences). As part of this trip we will be returning to the Ministik Lake AARDDVARK antenna which has certainly had a very hardlife. Since November it has mostly behaved, and we hope to find it in good conition [24 July 2013]. Our SPeCIMEN plan for SCOSTEP accepted! Scientific Committee on Solar Terrestrial Physics (SCOSTEP) is an interdisciplinary body of the International Council for Science (ICSU). SCOSTEP runs international interdisciplinary scientific programs and promotes solar-terrestrial physics research. We recently helped prepare a white paper to submit to SCOSTEP, suggesting a project for their 2014-2018 Science Programme. Our project was named SPeCIMEN: Specification and Prediction of the Coupled Inner Magnetospheric Environment. After a panel meeting in Bern, Switzerland, SCOSTEP selected our project to be one of the 3 core SCOSTEP programmes which will run in that 5-year period. Assoc. Prof. Craig J. Rodger is part of the Executive Committee which will oversee this project. He also supported the preperation of another white paper which was combined with others to produce another project for SCOSTEP's plan, ROSMIC: Role of the Sun and the Middle Atmosphere/Thermosphere/Ionosphere in Climate. We are thrilled to hear SCOSTEP recognises the importance of our scientfic directions, and the new collaborations this will spark [14 May 2013]. 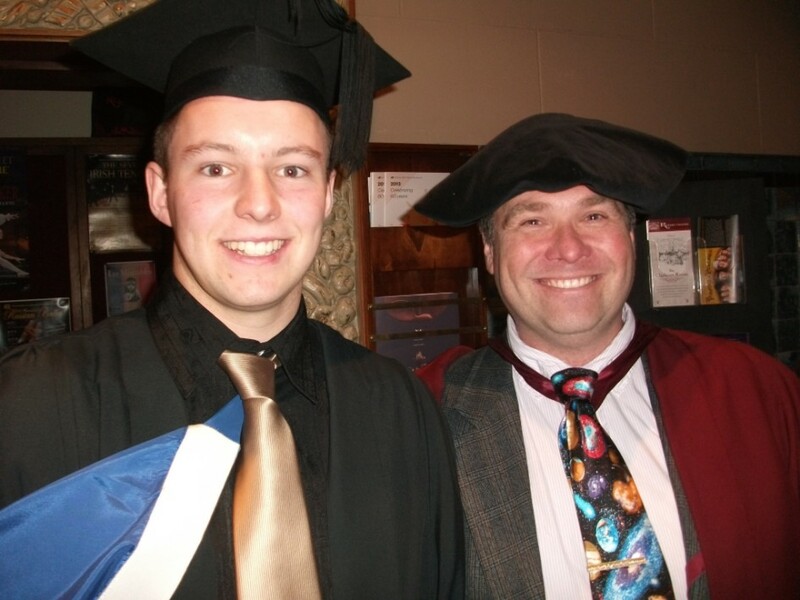 Congratulations to Space Physics graduate research student Jason Neal who graduated at the University of Otago ceremony on Saturday 4 May. Jason passed across to the stage to have his Bachelor of Science with Honours conferred, awarded in Physics at a First Class Level. It was a great day! [4 May 2013]. Our long term collaborator, British Antarctic Survey scientist Dr Mark Clilverd, has arrived in Dunedin to work with all the members of the group. Mark has come to Dunedin for a 2 week visit to finish off a couple of papers on the measurement of radiation belt precipitation, but also to interact with the research students [18 April 2013]. 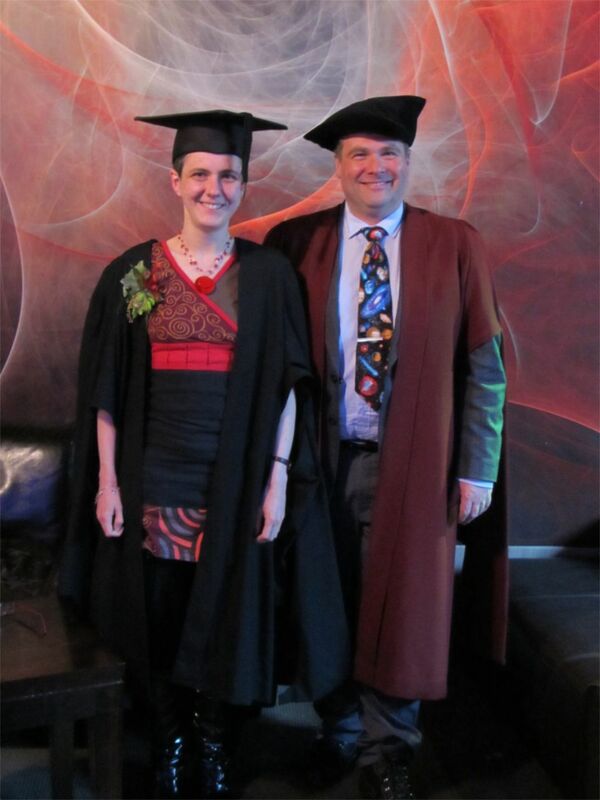 Congratulations to Space Physics graduate research students Bonar Carson and Kathy Cresswell-Moorcock who will be graduating at the University of Otago ceremony tomorrow. Bonar will pass across to the stage to have his MSc conferred, while Kathy is graduating with a PGDipSci. Both have been awarded their qualifications with Distinction. Well done to Bonar and Kathy! [14 December 2012]. 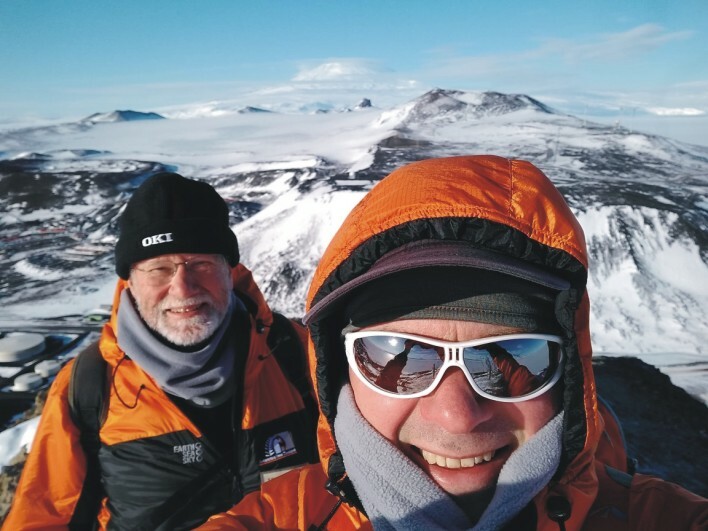 The two-man team making up the fifth Antarctic expedition from the Otago Space Physics group to Antarctica returned to Dunedin on Tuesday this week. 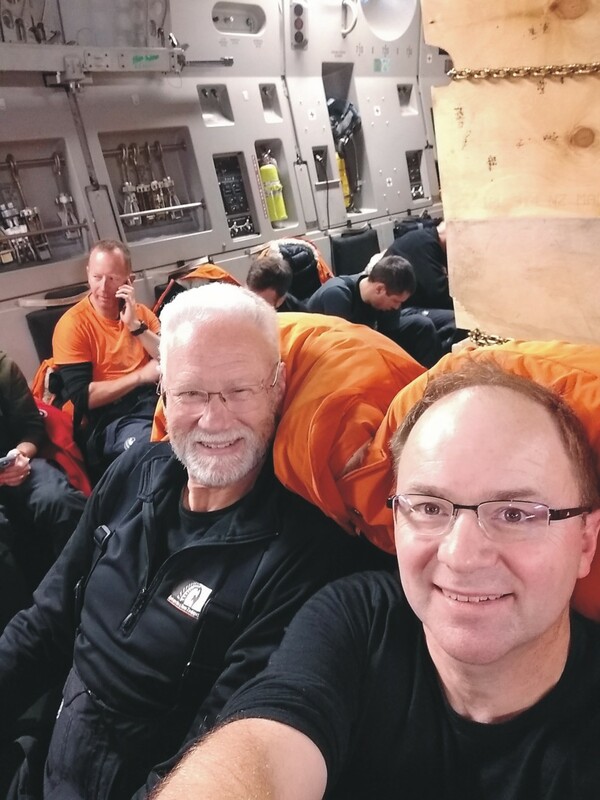 Dr James Brundell, the event leader, and Dr Ian Whittaker, flew out of Antarctica on the morning of Monday 3 December on a USAF C-130, and landing in Christchurch in the early evening. During thier time in Antarctica they moved our computer and electronics into a new room in the Arrival Heights Kiwi Lab, gathered data, checked the gear was well, and undertook electromagnetic noise measurements. All the data from our AARDDVARK experiment looks good, before and after the shift. Another successful (and quick) trip to Antarctica. The logistics support for Expedition 5 is provided through Antarctica New Zealand Event K060. [7 December 2012]. James and Ian next to the AARDDVARK antenna with Erebus in the background. The two-man team making up the fifth Antarctic expedition from the Otago Space Physics group to Antarctica travelled to Christchurch on Sunday to be issued their Antarctic clothing. On Monday morning Dr James Brundell, the event leader, sent us a SMS alerting us they were delayed about 1 hour, but by 706am that morning he SMSed "On plane!" and by Monday afternoon James and Dr Ian Whittaker were emailing us back in Dunedin to confirm they had arrived at Scott Base. After a base tour they are scheduled to have dinner, their bags arriving at 7pm, and Antarctic Field Skills training starting at 845am Tuesday morning. The logistics support for Expedition 5 is provided through Antarctica New Zealand Event K060. [26 November 2012]. The fifth Antarctic expedition from the Otago Space Physics group is preparing for their trip South. Dr James Brundell, the event leader, is currently working alongside Dr Ian Whittaker, to undertaken noise tests and become familiar with some of the experimental equipment they will use when south. The team is scheduled to travel to Scott Base on Monday 26 November 2012 for a eight-day intensive working period. The logistics support, comprising air transport, accommodation, and all other on-ice support is provided through Antarctica New Zealand Event K060. 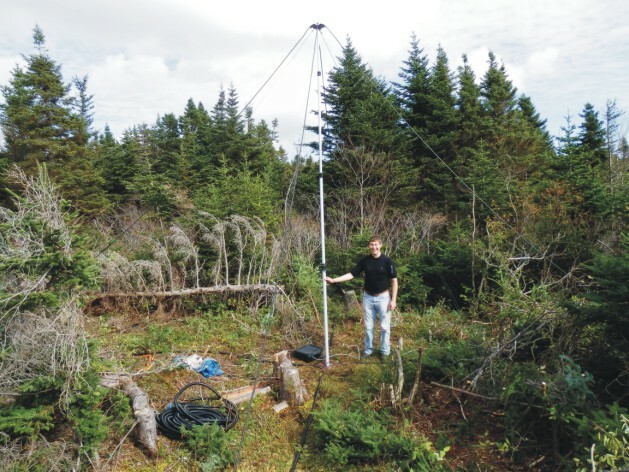 In early August 2012, the signal at the Ministik Lake AARDDVARK antenna suddenly dropped out - less than 3 weeks after we had travelled to Canada to repair it. We quickly identified the problem had been caused by a near-by lightning strike, which must have damaged the experiments electronics. Today, 9 November 2012 (NZ time) staff from the Space Physics Group from the University of Alberta went out to Ministik Lake and replaced the preamp - and the data is now flowing again. The new preamp has been upgraded to withstand lightning better in the future. We hope. This instrument has certainly had a very hard time, detailed on this webpage. [9 November 2012]. In early September 2012 Assoc. Prof. Craig Rodger and Space Physics PhD student Aaron Hendry travelled to Sao Paulo (Brazil) to attend the 5th VERSIM workshop, the first time the workshop had been held outside of Europe. Because of the transport links between New Zealand and Brazil they flew via the United States, which allowed us to visit the Udvar Hazy Center (Smithsonian Air and Space Museum). 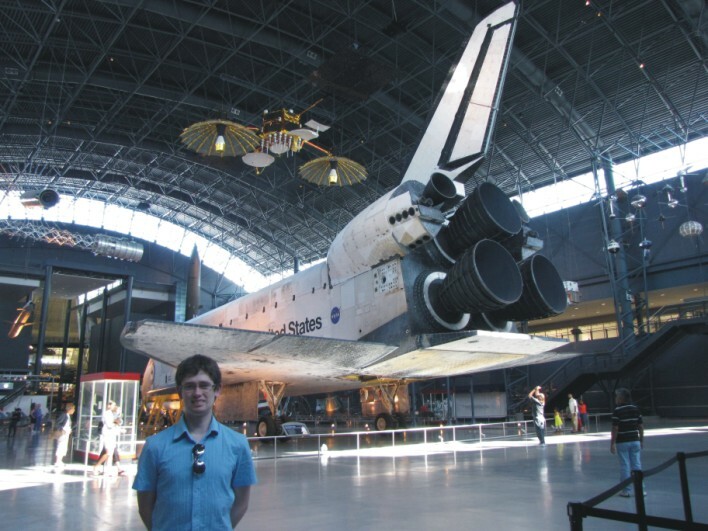 There is a particularly nice image on the space physics image collection of Aaron Hendry standing in front of the Space Shuttle Discovery (OV-103). During the VERSIM workshop one of Craig's presentations was recorded and put up on You Tube. People often comment on Craig's presentation style, and this is an example of him in action [6 September 2012]. 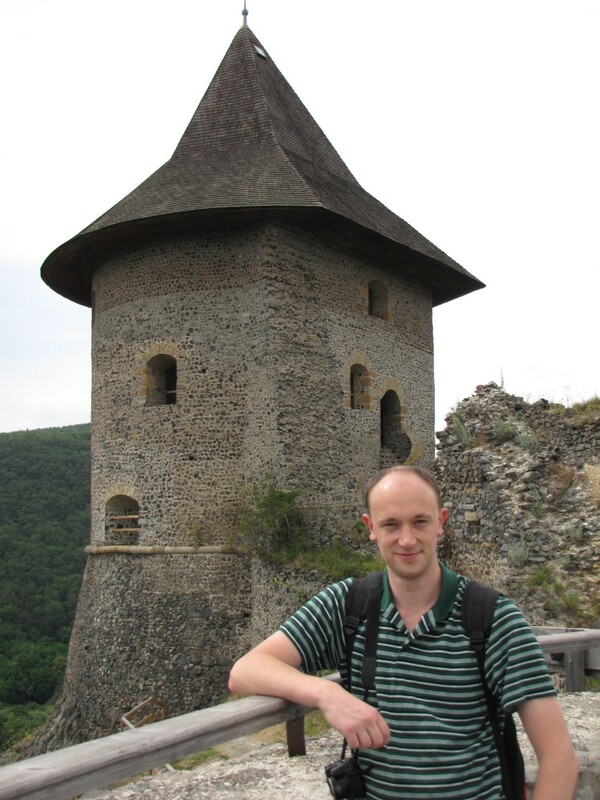 In mid-July 2012 Dr James Brundell and Assoc. 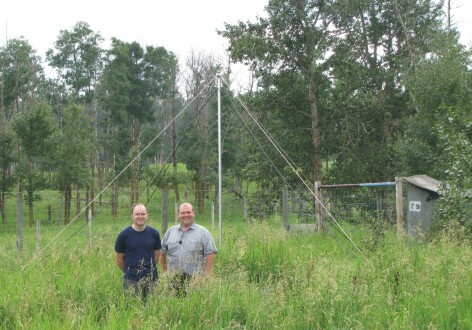 Prof. Craig J. Rodger travelled to Edmonton in Canada to repair AARDDVARK antenna installed at Ministik Lake, Alberta, Canada. 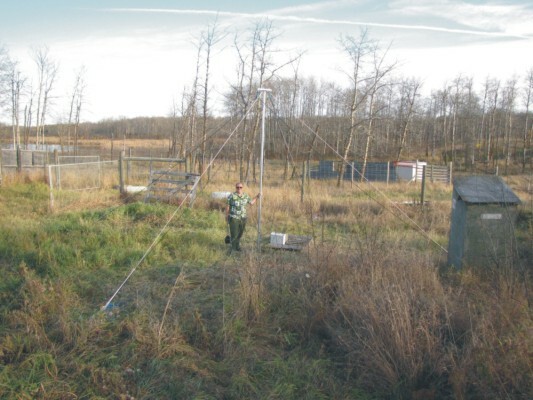 The antenna was installed in October 2010, and is located at a field site of the Space Physics Group from the University of Alberta. The Ministik AARDDVARK antenna also provides data to the world wide lightning location network, WWLLN. This instrument has had a hard time, detailed on this webpage. It has suffered from computer failure and the attention of the local wildlife. Craig and James headed out to repair and upgrade the instrument, so it is better suited to make continuous measurements in the next few years to support the RBSP and DSX spacecraft missions, and the BARREL balloon campaigns [21 July 2012]. James and Craig with the repaired antenna. 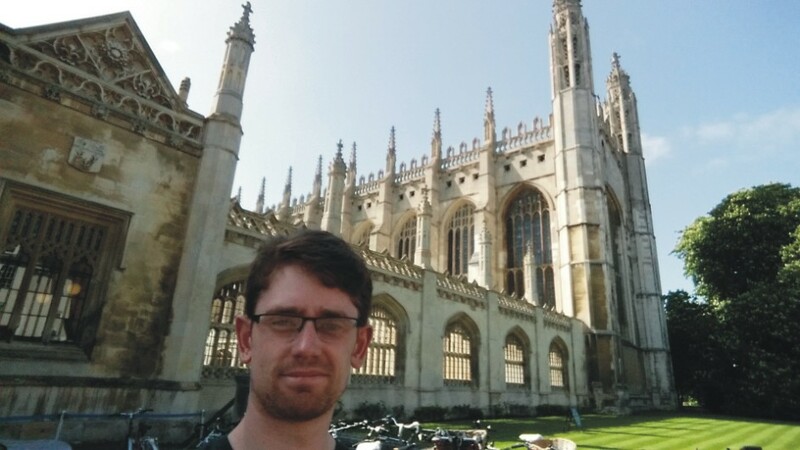 Dr Ian Whittaker arrived in the Space Physics group in early July 2012, taking up a Postdoctoral Fellowship position - Ian is working on energetic electron precipitation and its link to the plasmasphere, funded by the European Union FP7 project (PLASMON). W are thrilled to welcome Ian to the group, and hope to add his photo to the group website soon. [5 July 2012]. 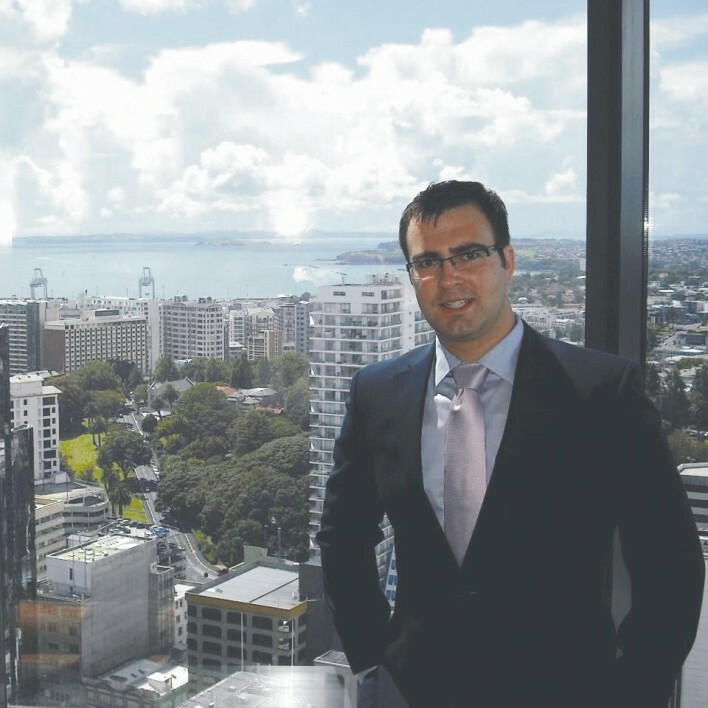 Former Space Physics MSc student Bonar Carson is now living in Auckland working as a financial analysis for ASB. We have received a picture of Bonar showing him in his new work environment and looking sharp indeed. The examination process for Bonar is all over bar the corrections, and we have recently submitted a paper to the Journal of Geophysical Research based on his MSc work. Bonar is now about to feature in the Otago Physics Department publicity material, in the Graduate Profile section [12 June 2012]. Our long term collaborator, British Antarctic Survey scientist Dr Mark Clilverd, has arrived in Dunedin to work with us. Mark will be in Dunedin for the next two weeks or so, are focusing on radiation belt and substorm-driven precipitation studies. Our main goals for Mark's visit is to finish off some research papers and to get Mark working with some of our new research students [18 April 2012]. Space Physics academic Assoc Prof. Craig Rodger was interviewed on the Morning Report show on New Zealand's National Radio. The interview concerned the X5 solar flare which occurred on 7 March 2012, and the impact of the associated coronal mass ejection. The interview is online on their website [9 March 2012]. The next day Craig was interviewed on Saturday morning with Kim Hill, and this interview is also online [10 March 2012]. The fourth Antarctic expedition from the Otago Space Physics group returned from the ice last Monday (5 December 2011) after a successful visit. After some weather-related delays, the two man team set off on Monday 28 November 2011, and with hard work managed to complete the primary goals of the expedition in time to fly back only 1 week later. Peter McCabe and James with the antenna. The fourth Antarctic expedition from the Otago Space Physics group is preparing for their trip South. Dr James Brundell, the event leader, is currently working alongside Mr Peter McCabe, Physics Department Head Technician, to test the experimental equipment they will use on the ice. The team is scheduled to travel to Scott Base on Wednesday 23 November 2011 for a ten-day intensive working period. The logistics support, comprising air transport, accommodation, and all other on-ice support is provided through Antarctica New Zealand Event K060. Dr Rory Gambles completes PhD, is awarded "Exceptional Thesis"
Rory Gamble submits PhD, wins Prize! 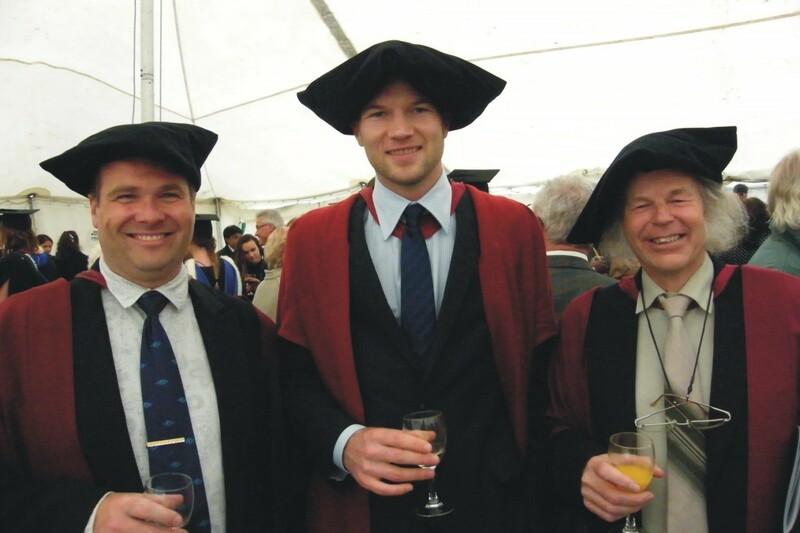 In late March 2011, PhD candidate and Space Physics student Rory Gamble submitted his PhD thesis ("The 17-19 January 2005 Atmospheric Electron Precipitation Event"); the next day he left New Zealand to take up a research position at the Sodankylä Geophysical Observatory in Finland. Almost at the same time we found out that Rory had won a Outstanding Student Paper Award in Space Physics & Aeronomy for his presentation at the American Geophysical Union 2010 Fall Meeting in San Francisco, California. Congratulations to Rory on a very impressive week! [31 March 2011]. Exciting news from Europe - in collaboration with our European, US and South African colleagues, we are being funded through a European Union FP7 project. The project is entitled "A new, ground based data-assimilative modeling of the Earth's plasmasphere - a critical contribution to Radiation Belt modeling for Space Weather purposes", and has the short name PLASMON. It includes multiple institutions worldwide but is led by Dr. Janos Lichtenberger of Eötvös University (ELTE), Budapest - Hungary, who has visited us twice before in Dunedin. We will be strongly involved in Work Package 4, which will make use of AARDDVARK data, and Assoc. Prof. Rodger is the leader of Work Package 5, dissemination. The Otago support is €352,357 (out of €1,972,269 total), and will fund a PostDoc and a PhD student in the Otago Space Physics group. More information at the PLASMON website. [12 January 2011]. 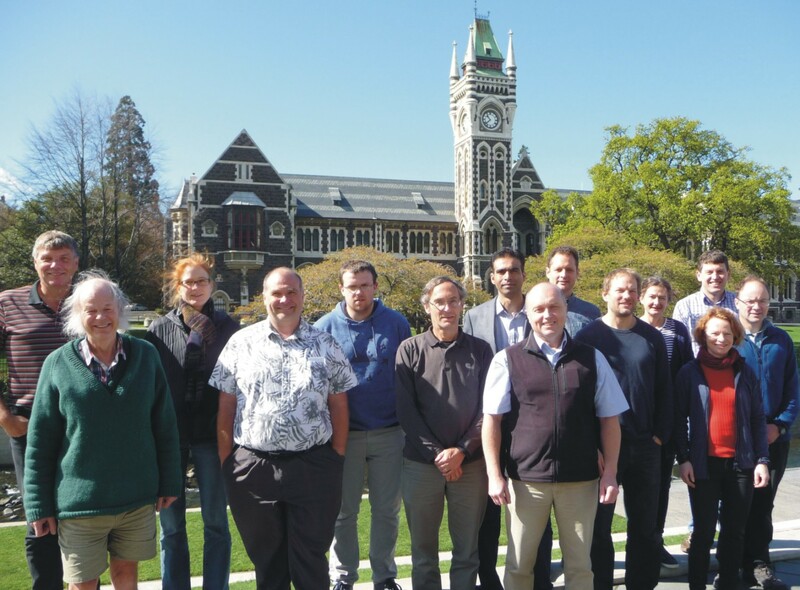 From January-April 2011 the Otago Space Physics group is hosting Assoc. Prof. Sushil Kumar of the University of the South Pacific (Fiji). Assoc. 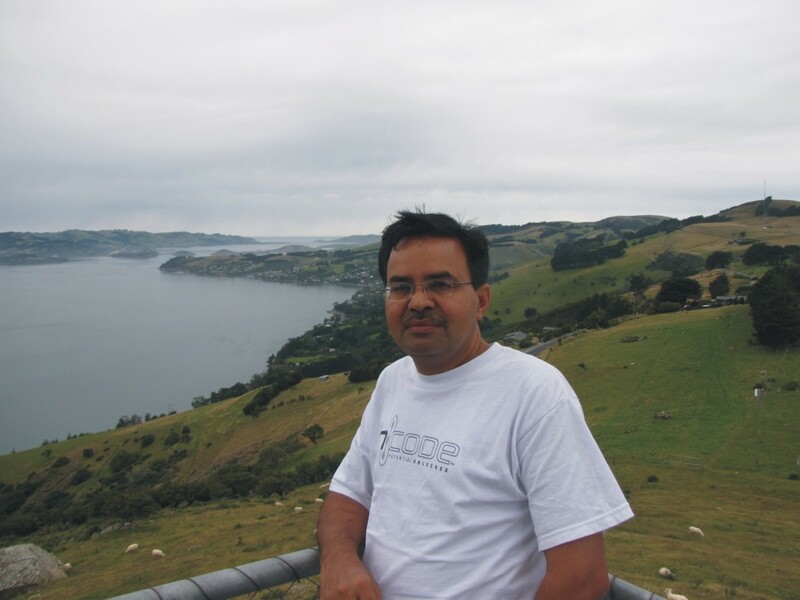 Prof. Kumar is visiting the as the 2011 Ratu Sir Kamisese Mara Fellow, an award which funds staff from the University of the South Pacific to work for up to 3 months with researchers from Otago. Assoc. Prof. Kumar plans to work with us on lightning, red sprites, and subionospheric VLF propagation. [10 January 2011]. In November 2010 an international two-man team will be travelling to Antarctica to visit the Otago Space Physics Group's experiment. The team is scheduled to travel to Scott Base on Wednesday 24 November 2010 for a brief seven-day visit to the ice. 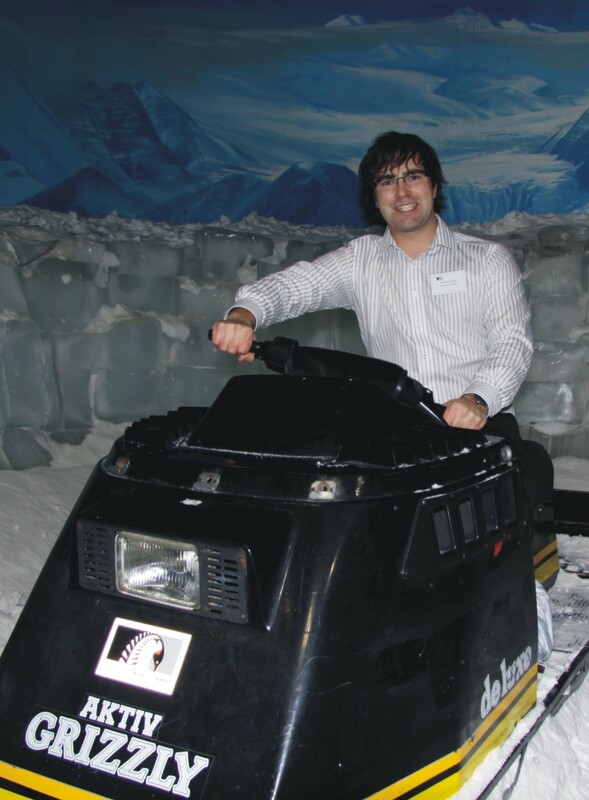 Dr Craig Rodger, the event leader, will accompany British Antarctic Survey scientist Dr Mark Clilverd. The logistics support, comprising air transport, accommodation, and all other on-ice support is provided through Antarctica New Zealand Event K060. The researchers are travelling to Antarctica to undertake maintenance on Otago's AARDDVARK radio receiver which is located at Arrival Heights, not far from Scott Base. The Space Physics group deployed this radio receiver in December 2008. Feedback from the Antarctica New Zealand Scott Base technicians have identified damage to our antenna cables, likely caused by the strong winds at Arrival Heights. Mark and Craig will be replacing these cables, checking for other damage, gathering up the data for the last year, and undertaking calibration of the gear. Dr. Mark Clilverd, visiting the group from the British Antarctic Survey has now headed out of Dunedin, on his way back home. Mark spent 2.5 weeks with us, primarily working with Dr. Craig Rodger, but also Assoc Prof. Neil Thomson, and students Rory Gamble and Sarah Dietrich. 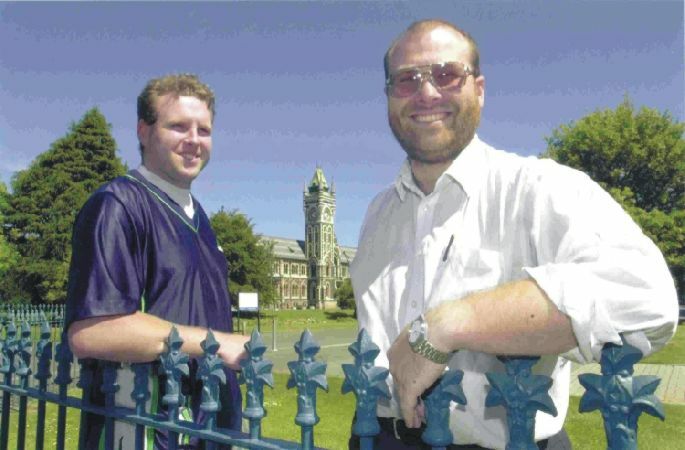 Mark is a regular visitor to Dunedin, and some of the visit was used so he and Craig could plan their joint activities in 2010. We hope to see him again for Summer next year. We enjoyed some walks around Dunedin, some dinners out, and of course a lot of Scientific Discussion. [24 January 2010]. The Space Physics Group of the Physics Department is about to send two researchers to Antarctica. The two-man team is scheduled to travel to Scott Base on Wednesday 2 December 2009 for a brief nine-day visit to the ice. 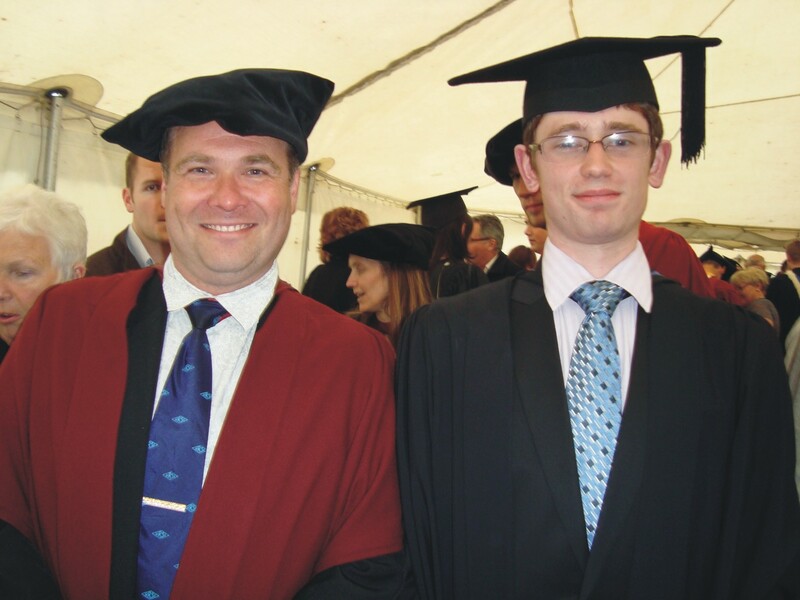 Dr James Brundell, the event leader, will accompany Space Physics PhD student Mr Rory Gamble. The team's transport and on-ice support will be provided through Antarctica New Zealand Event K060. 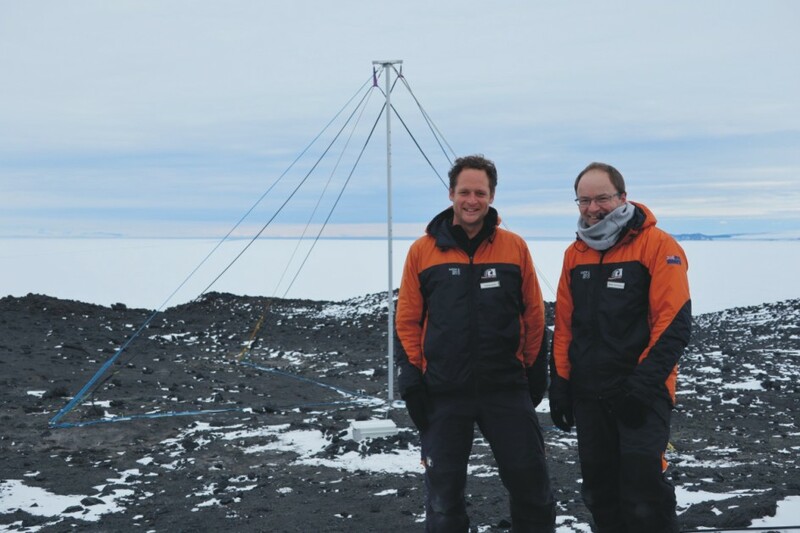 The researchers are travelling to Antarctica to gather data from Otago's AARDDVARK radio receiver which is located at Arrival Heights, not far from Scott Base. The Space Physics group deployed this radio receiver in December 2008, and a big part of this year's trip is to see how the antenna and electronics have survived a year in the very high winds and cold temperatures up at the Heights. Space Physics news from before late October 2009, when the Physics Department updated its webpage. The old Space Physics webpage is available for you to take a look at. Read the Physics Today article on the research undertaken by Otago PhD student Rory Gamble , published in the August 2008 issue of this publication. 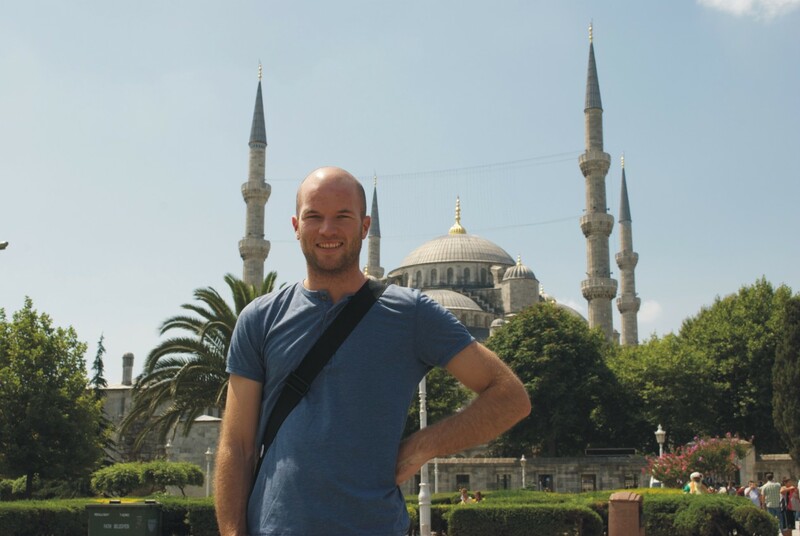 Space Physics student Rory Gamble wins an URSI Young Scientist Award to travel to Chicago. Afterwards he goes to Cambridge (UK) and also to Hungary. Hear the interview with Dr. Craig Rodger on the Australian Broadcasting Corporation's "The Science Show", broadcast across Australia on 10 November 2007. Otago Space Physics Group reports on the environmental effects of manmade control of the Radiation belts. US satellite protection scheme poses global communications threat . Read the New Scientist piece commenting on our research. Hear the interview with Dr. Craig Rodger on the Australian Broadcasting Corporation's "The Science Show", broadcast across Australia on 5 August 2006. 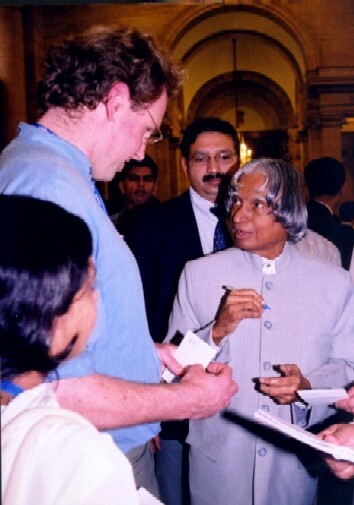 Space Physics student Robert McCormick wins an URSI Young Scientist Award and meets the President of India! Emeritus Professor Dowden gives the Fourth Annual Mindlin Lecture at the University of Washington, Seattle. See the video interview with Dr. Craig Rodger on the Royal Society of New Zealand's E=mc2 website. 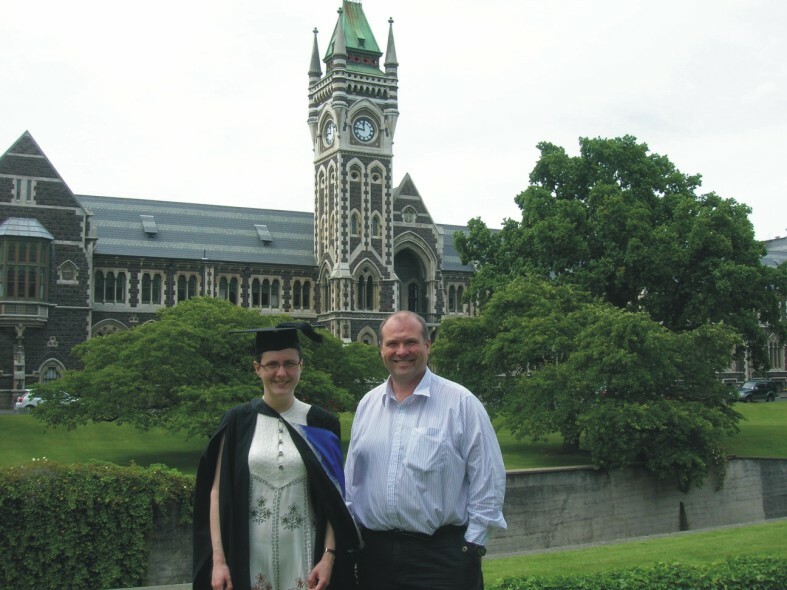 Dr. Craig Rodger is awarded a University of Otago Early Career Award for Distinction in Research (2004). Read our press release announcing the new measurement. More information? How about this BBC Science report, or the SOHO imagery of this flare. highlight of Geophysical Research Letters (Rodger et al., 2002). author from the southern hemisphere has made the cover of this journal. Results from our sprite finding trips to Darwin Australia 1997 and Colorado USA 1996.